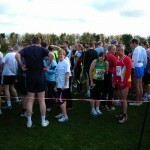 The Countdown to a World Record?? Excitement is certainly starting to mount here at PuckerUp4PH as we move towards the end of November with the first batches of blue lip prints starting to arrive from the 4 corners of the Earth. 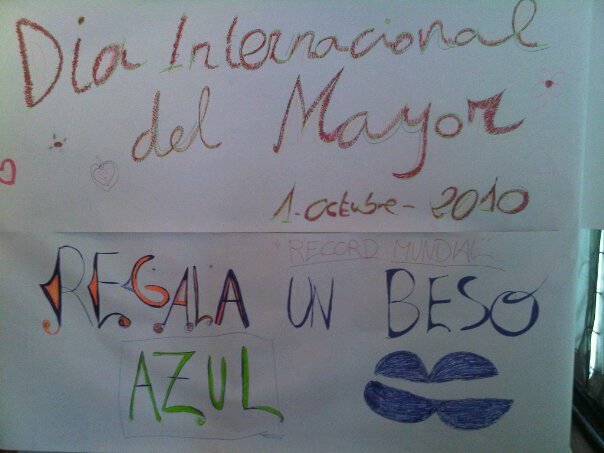 We will not know officially as to whether we have broken the world record until such time as it is adjudicated..but if the numbers of kisses heading our way from Puerto Rico are anything to go by (over 10,000, a quarter of our total) we could be on track to surpass our goal of 40,000 lip prints. 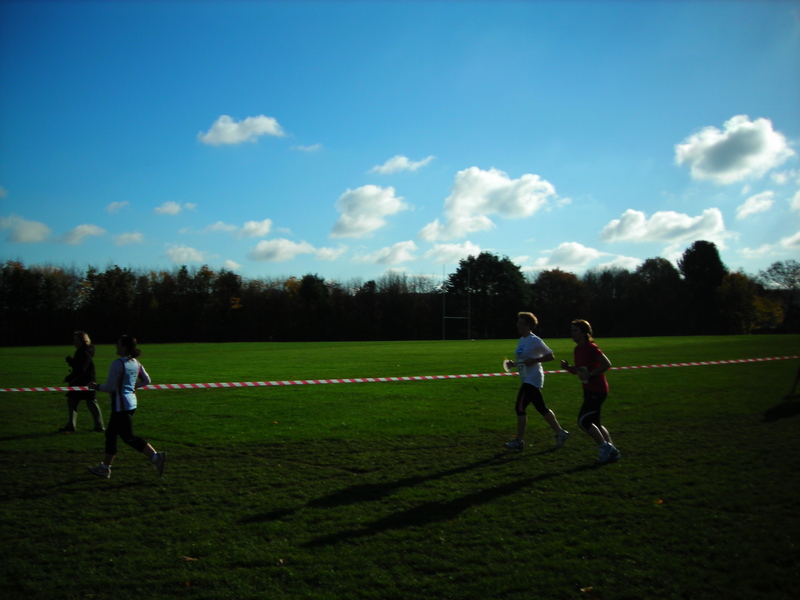 We know of more activities taking place this week across the world and wish everyone well with their endeavours. 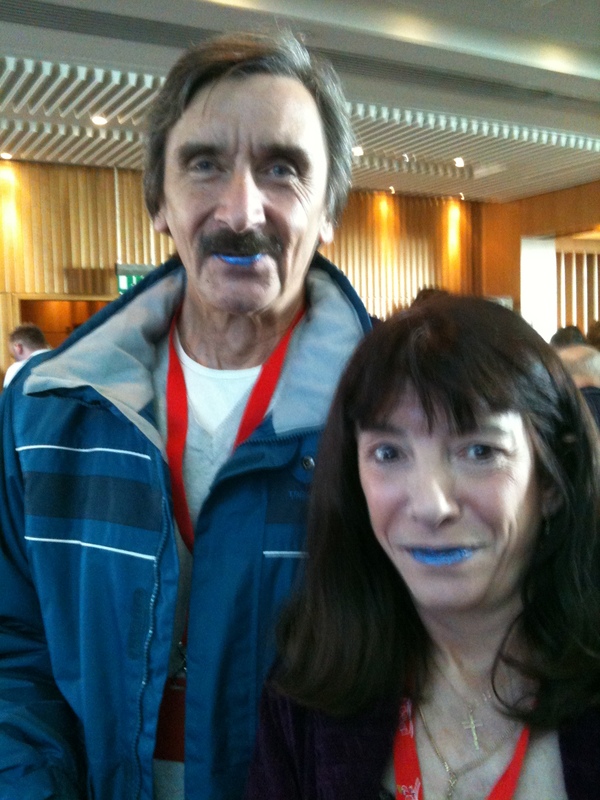 Many thanks to everyone who is busying themselves putting together the lists of all the people who have become PH aware and contributed their lips to our World record attempt. 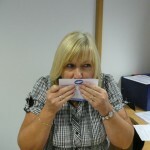 This effort really does make a difference to the processing time of the world record attempt. 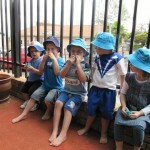 We’ll keep you up to date with all the developments as they happen on the run into the end of this campaign. 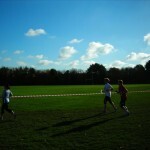 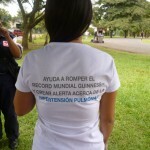 The Race for the Finish Line in International PH Awareness Month! 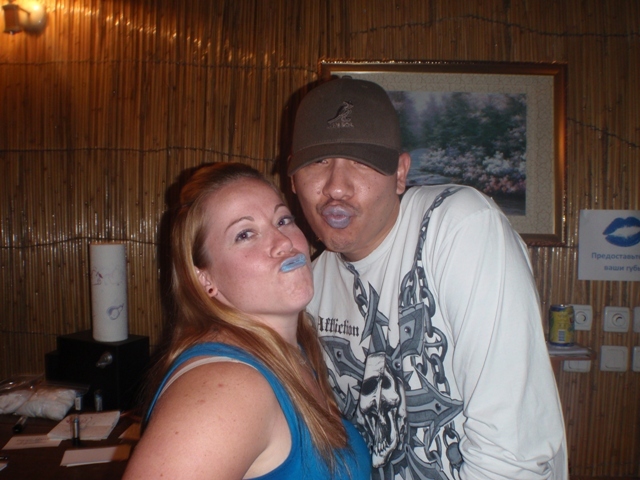 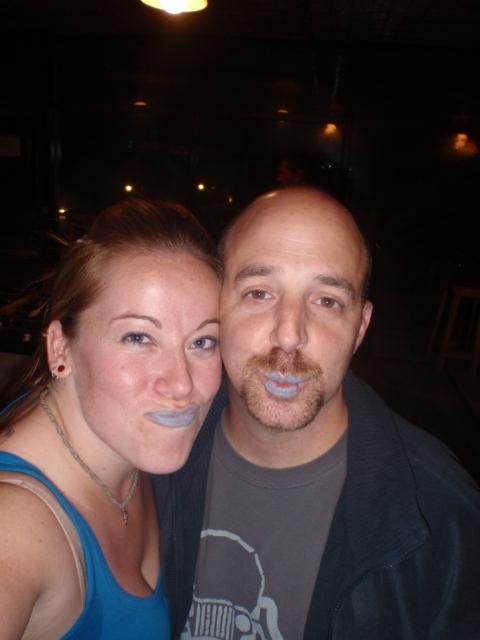 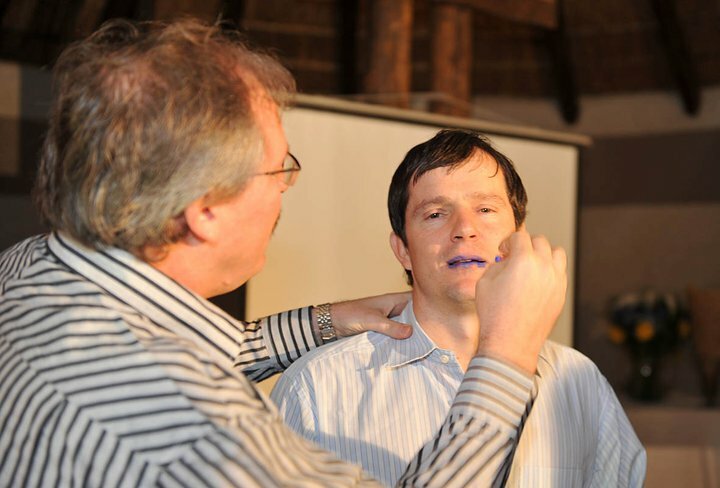 It’s November, International PH Awareness month, and people all over the world are doing their best to help us towards this global goal of setting a new Guinness World Record TM for the largest collection of blue lip prints. 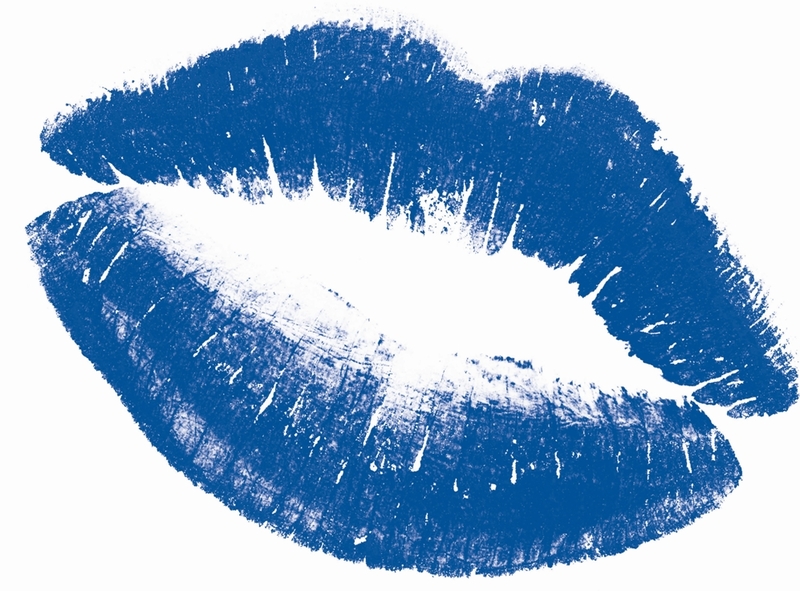 With only a few weeks to go, we are increasingly confident that if everyone continues with their current energy and inspiration, we’ll be able to finish the second year of the PuckerUp4PH initiative with some VERY exciting news! We’ve had word back that the Puerto Ricans and the Aussies have started to gather up all their kisses ready to send back to us, whilst the New Zealanders and the Italians have kisses winging their way towards us to join the first parcels already received from Germany and the USA – and we know there are many more to come! 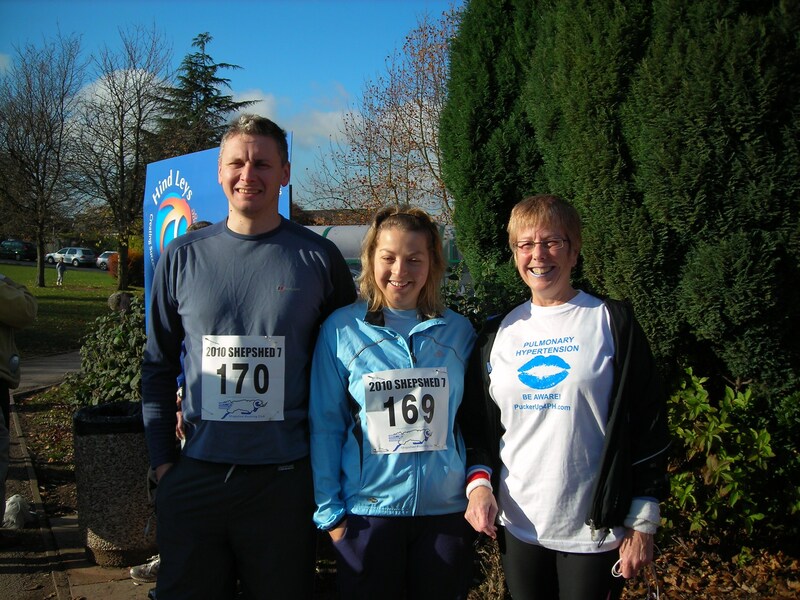 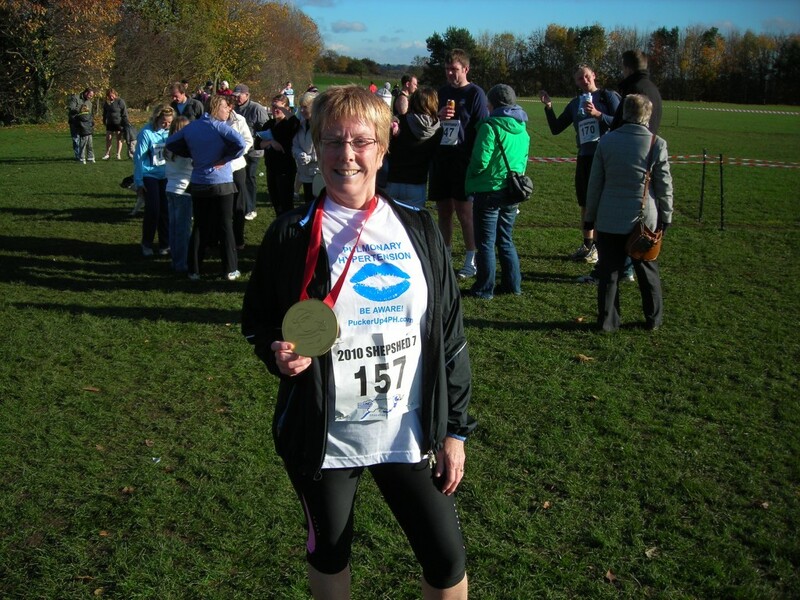 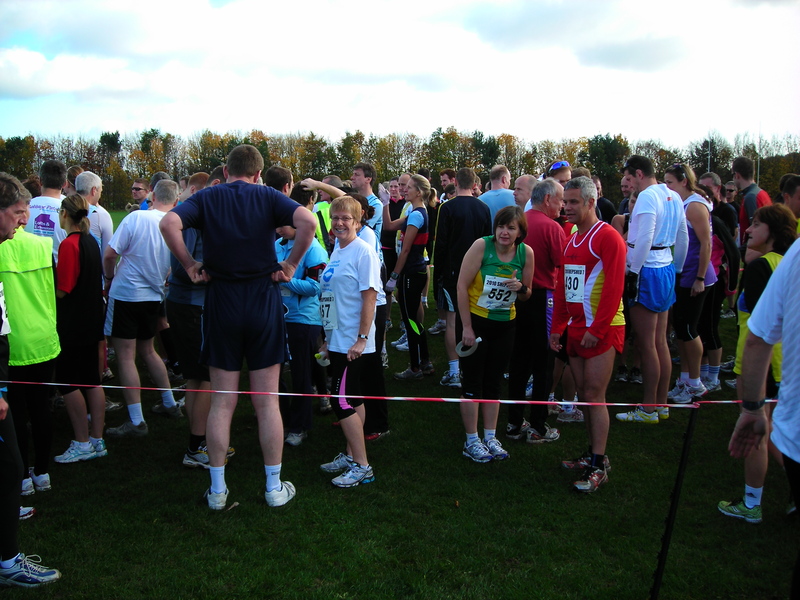 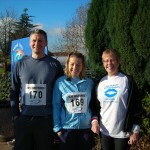 Let me start this week’s round up of Blue Lips activity with a huge CONGRATULATIONS to Linda Smith, mother of PHA-UK’s Jenny Leafe, who last Sunday ran the 7mile Shepshed 7 race in a fabulous time. 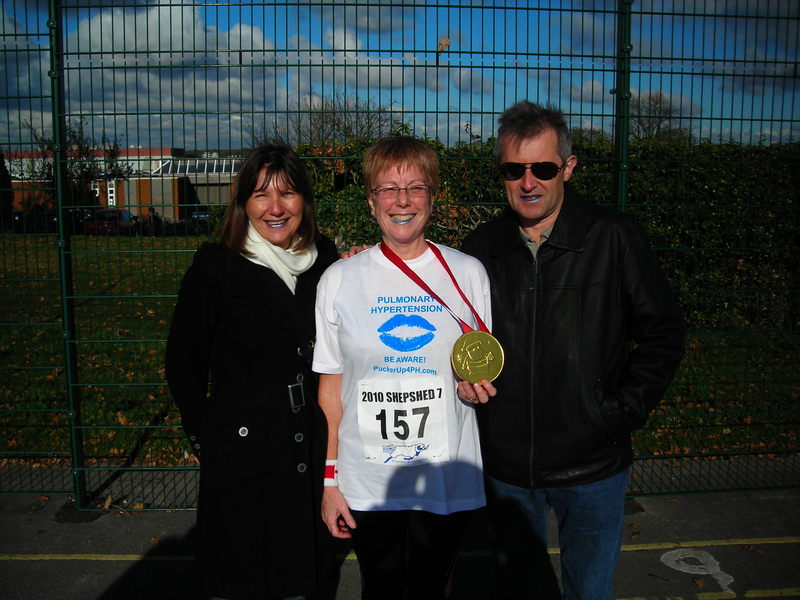 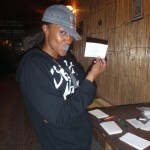 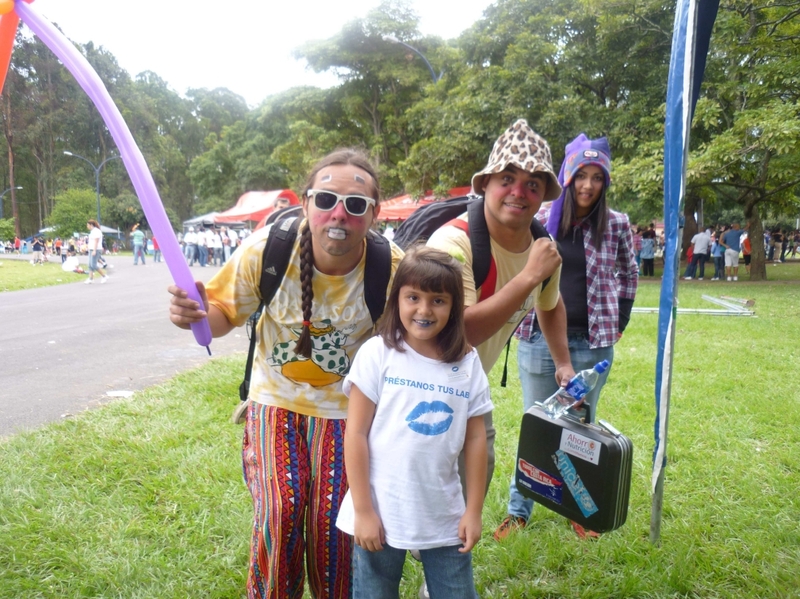 Linda far exceeded her fundraising goal for the PHA-UK and also prompted a lot of curiosity about PH and the initiative by completing the run wearing blue lips and a PuckerUp4PH t-shirt. 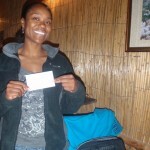 Thanks so much Linda! 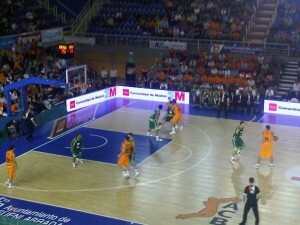 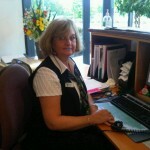 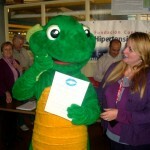 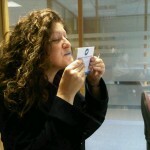 Over in Spain, PHA-UK’s Jane Taylor is at it again. This time collecting 60 blue kisses in under an hour! 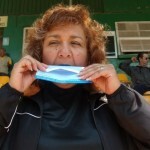 She has several more plans in Spain before she winds up her personal contribution to the record attempt including a booth at the local Christmas Fayre on the 20th of this month. 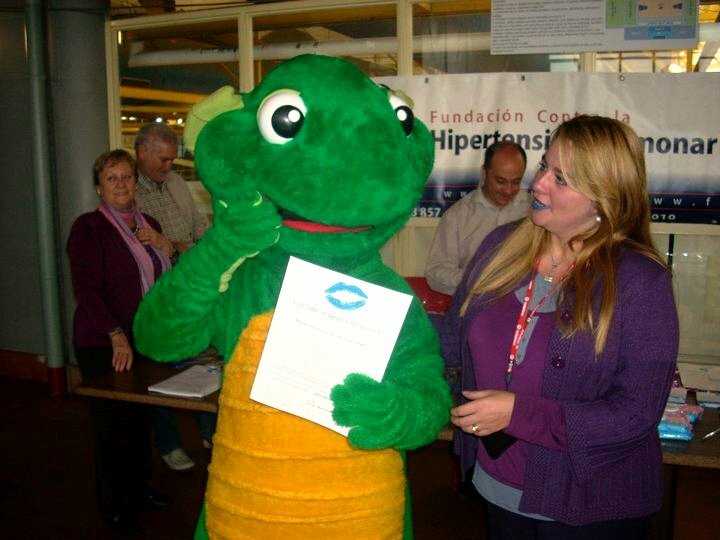 Also in Spain, the Fundación Contra la Hipertensión Pulmonar (FCHP) have been continuuing their PuckerUp4PH partnership with the Fuenalabrada Basketball team at another home game – this one attended by Fuenli who is the mascot of the children of the town of Fuenlabrada. 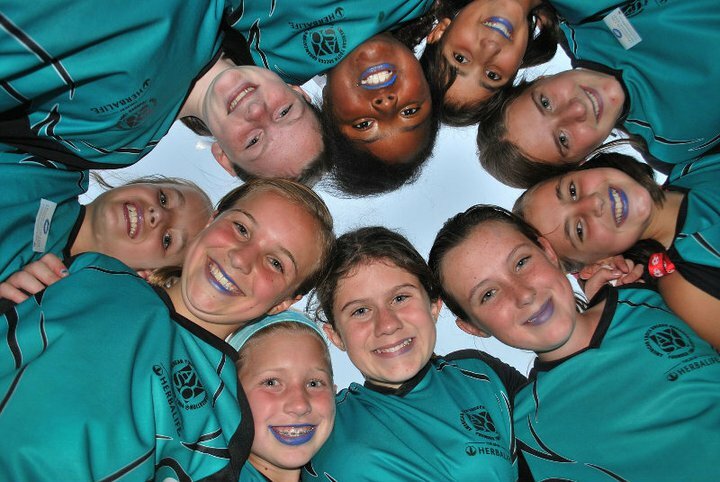 South Africa have joined the campaign also in the last few weeks and we really look forward to hearing more news about their first event! 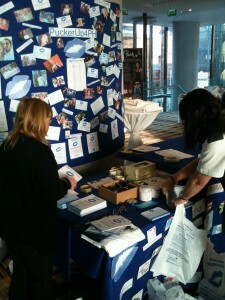 PHA-UK’s annual conference took place over the weekend in an event celebrating a decade of success for the association. 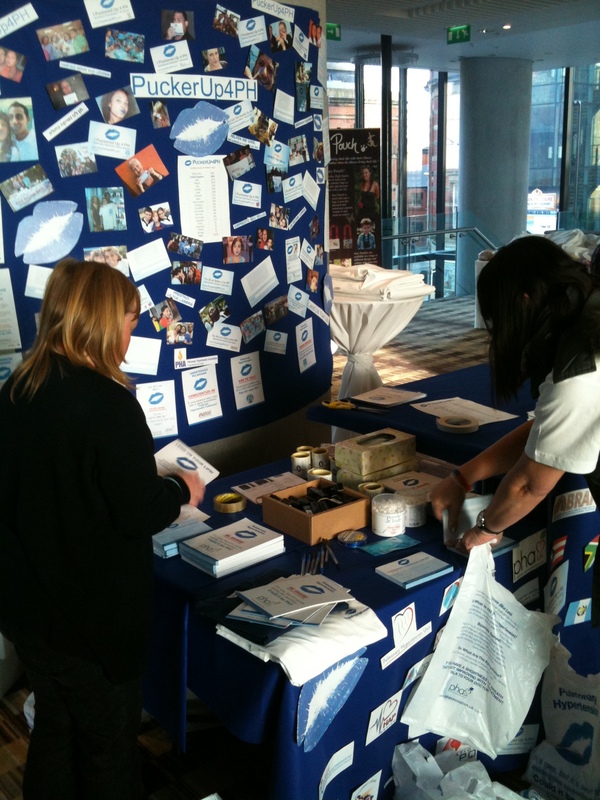 On an unusually sunny autumn Saturday in Manchester, the morning’s events included an address from PHA-UK Chairman Iain Armstrong, a presentation from PH Consultant Dr John Wort, several patient reflections and a “Question Time” with a panel of PH experts. 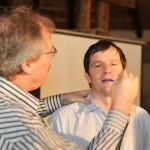 The conference was attended by over 200 PHA-UK members, family and friends and another 300 or so more were able to watch the proceedings via a live web-stream! 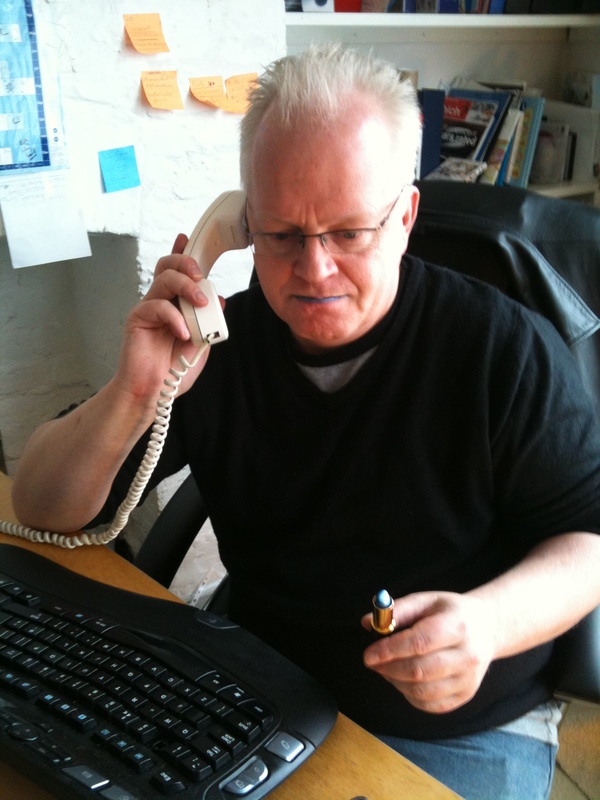 For all our friends around the world who couldn’t be there, the video is now archived on the PHA-UK website and can be viewed here. 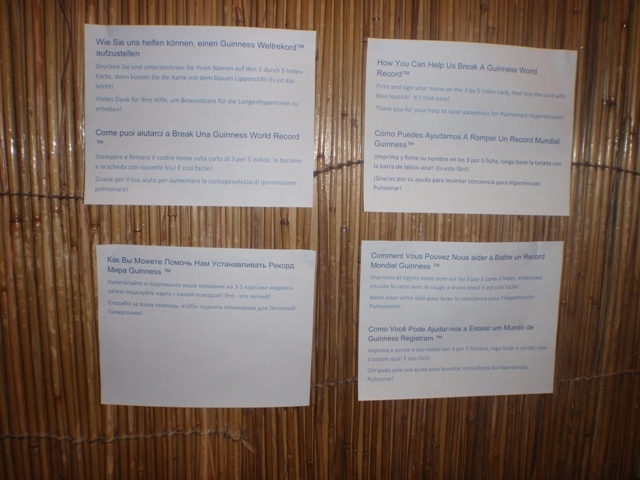 Break out activities in the afternoon included African drumming, pilates, hypnotherapy, Thai Chi, relaxation techniques, First Aid, a session to introduce the newly revamped PHA-UK website and the very popular chocolate making course! 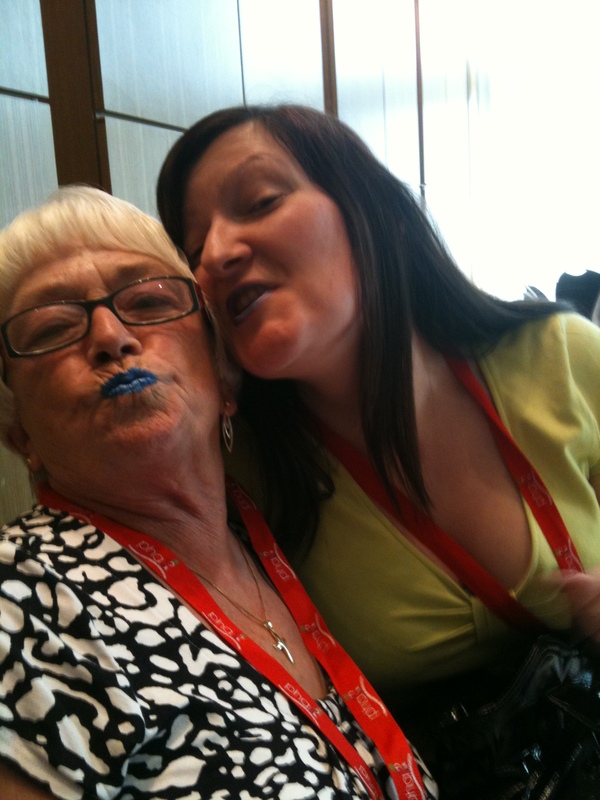 In between the sessions, members had the opportunity to catch up with friends, peruse a few trade stands and of course, PuckerUp4PH! 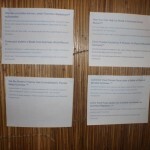 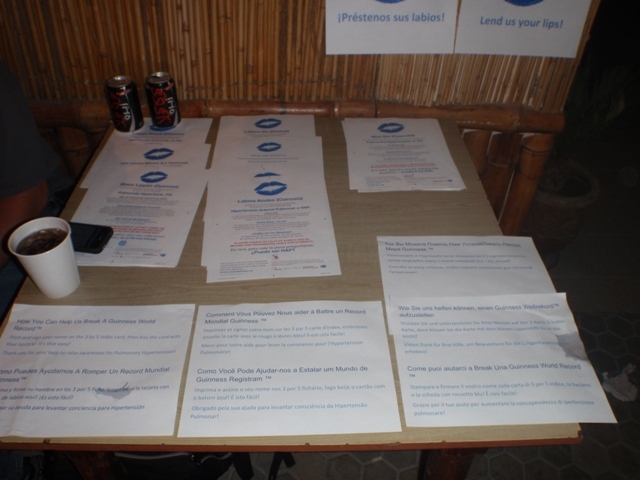 There was a lot of interest in the successes of all the other associations participating around the world and loads of our favourite photos from the global initiative were on display. Many attending have already lent their lips over the last couple of months so they took the opportunity to collect additional Blue Lips kits to see them through their final kiss collecting activities in November. 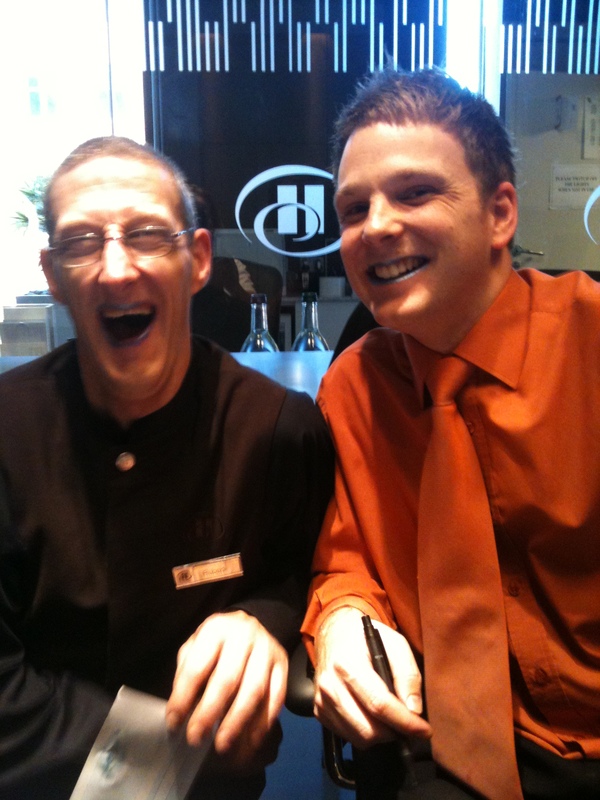 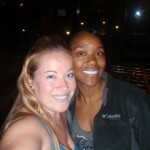 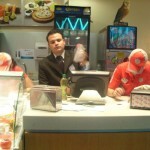 Even members of the crew and the friendly staff at the Hilton got involved! 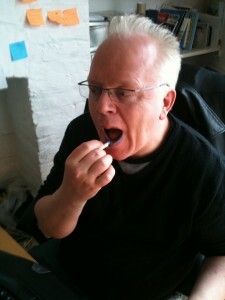 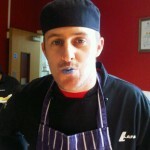 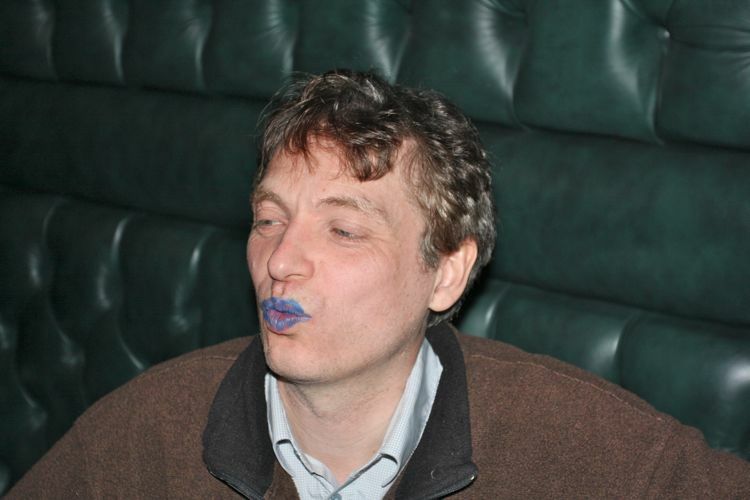 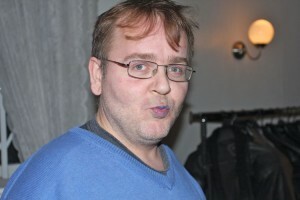 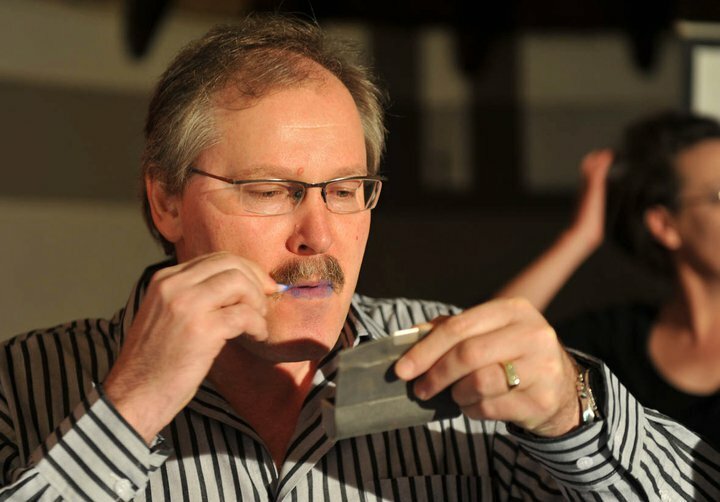 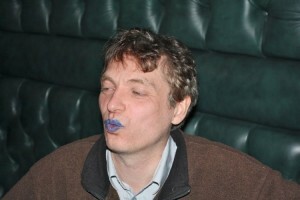 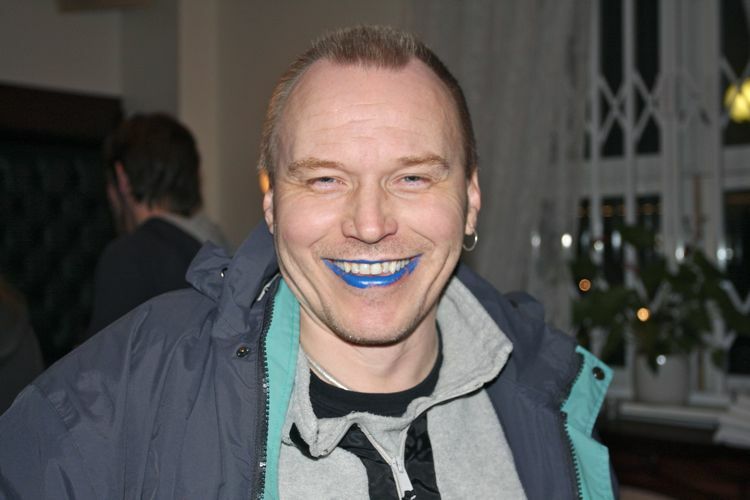 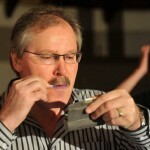 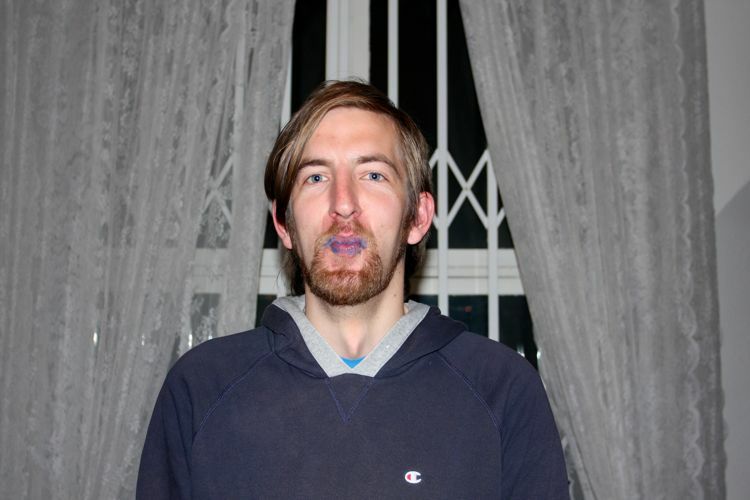 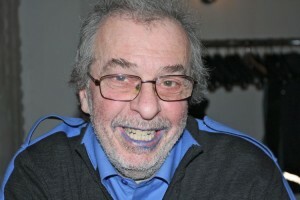 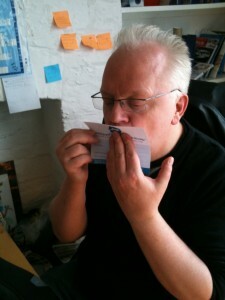 All in, 199 kisses were counted after the weekend, a number that didn’t seem to sit well with PuckerUp4PH campaign director Paul Pennington, so now back in the office he has rounded the tally up to 200 with his very own Blue Lip print! 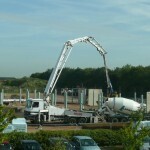 Others in the UK have been busy too. 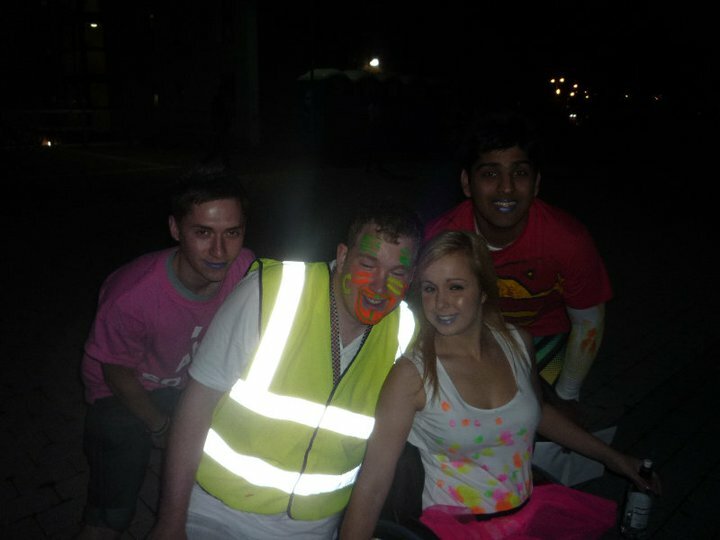 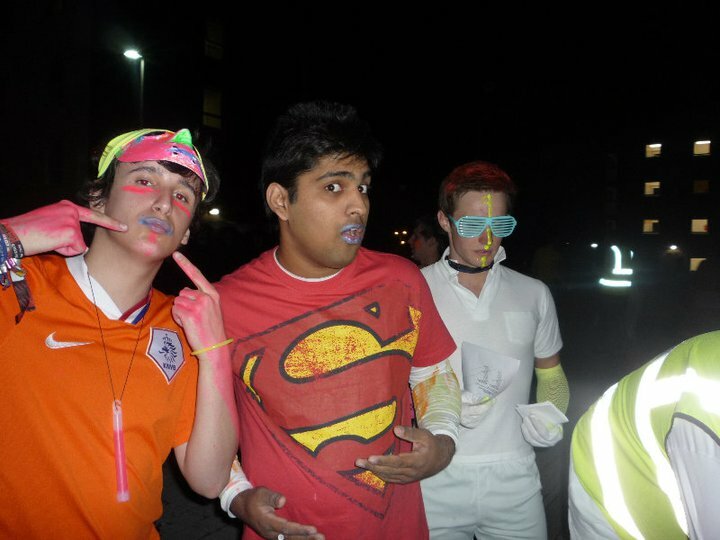 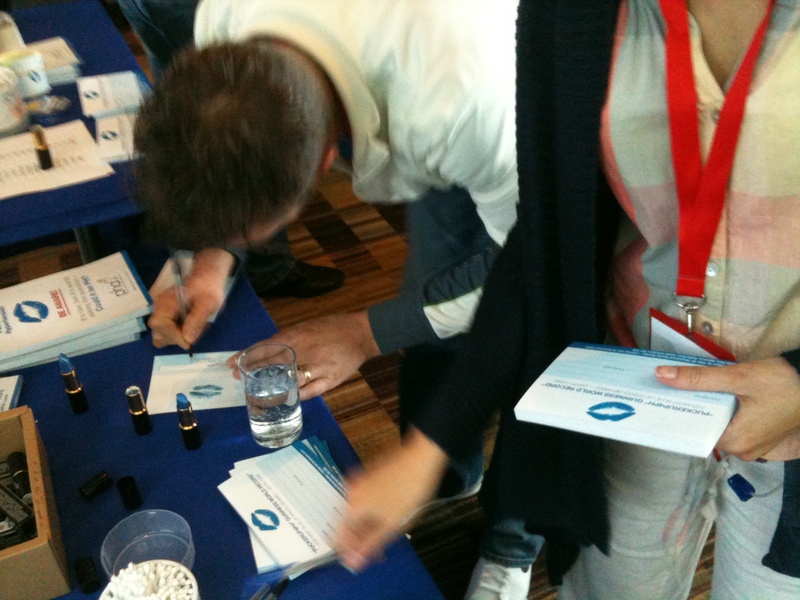 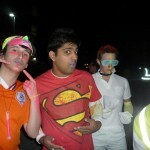 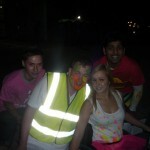 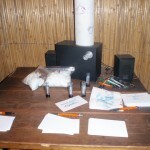 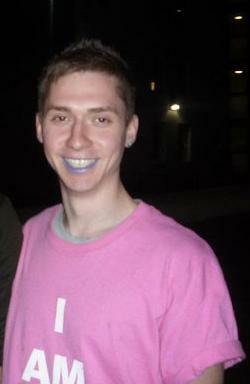 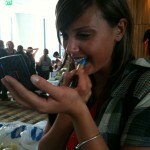 Loughborough Uni celebrated their freshers week with over 100 new students lending their lips and learning about PH. 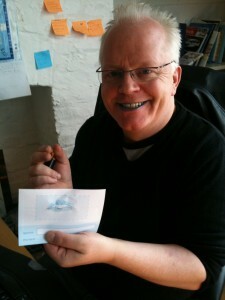 A huge thanks goes to Peter Dickenson of Robert Bakewell Hall for coordinating this contribution. 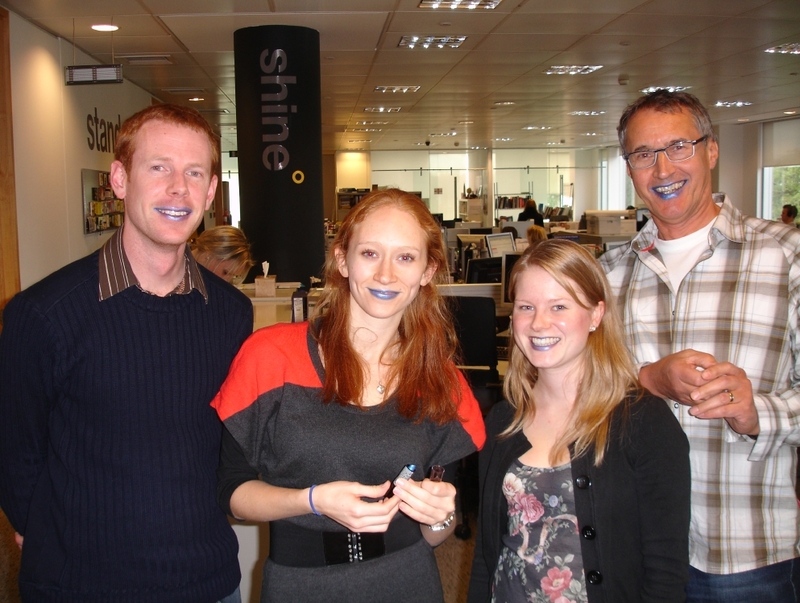 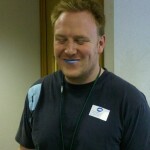 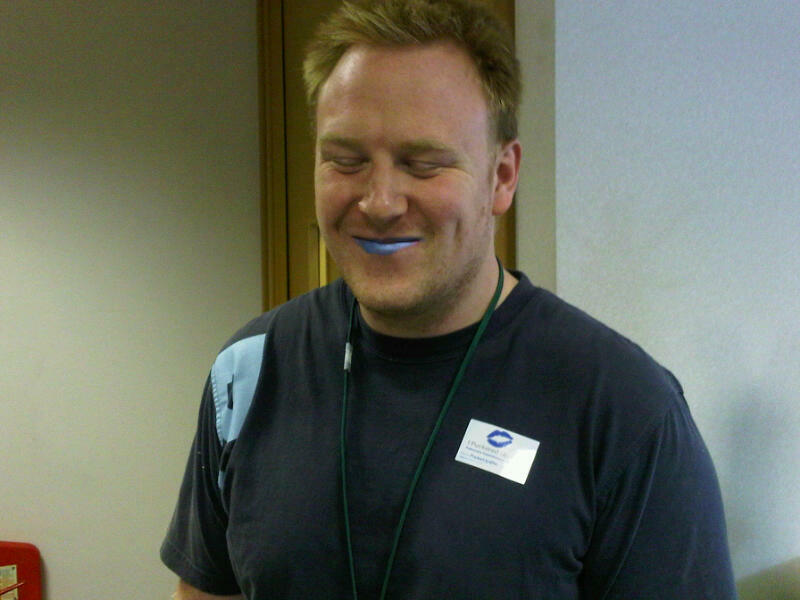 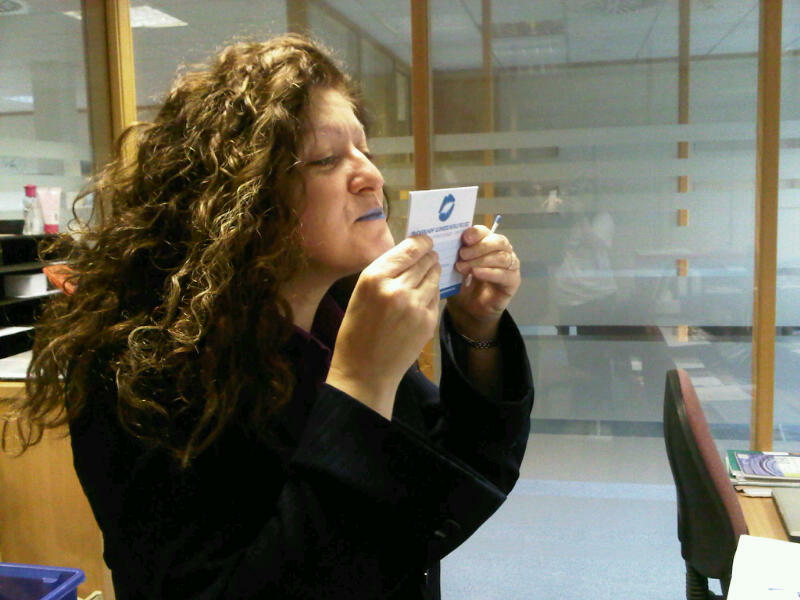 In London in the last week, DDB Health have done their bit to promote a greater awareness and understanding of PH in the workplace taking some time out to blue up, get kissing and adding another 115 kisses to the pot in the process. A very short time ago we welcomed PHA Norway to the campaign and just today we received news and photos of their very first kiss collecting activities. President of the association, Hall Skåra, is also a member of a Backgammon league which meets for regular tournaments. 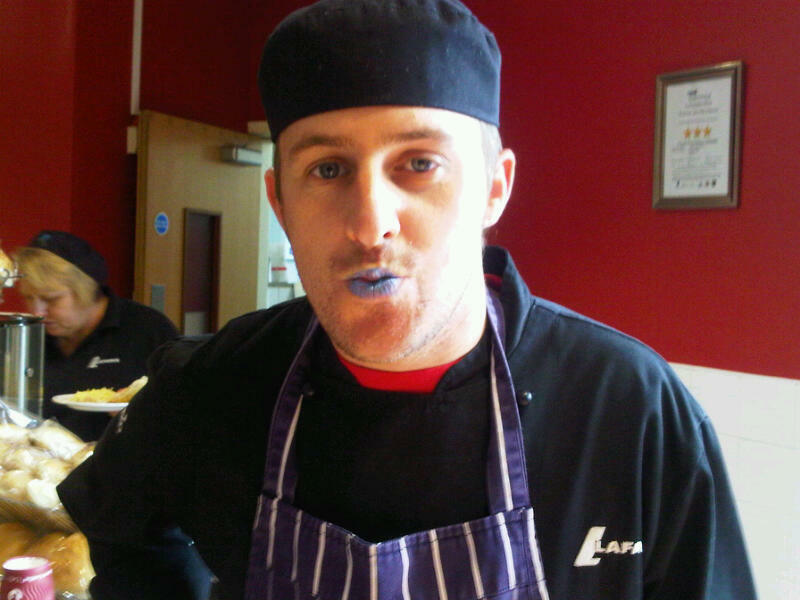 His fellow players understood that he had been unwell, but Hall found PuckerUp4PH to be a great opportunity to explain a little more about PH and its impact. 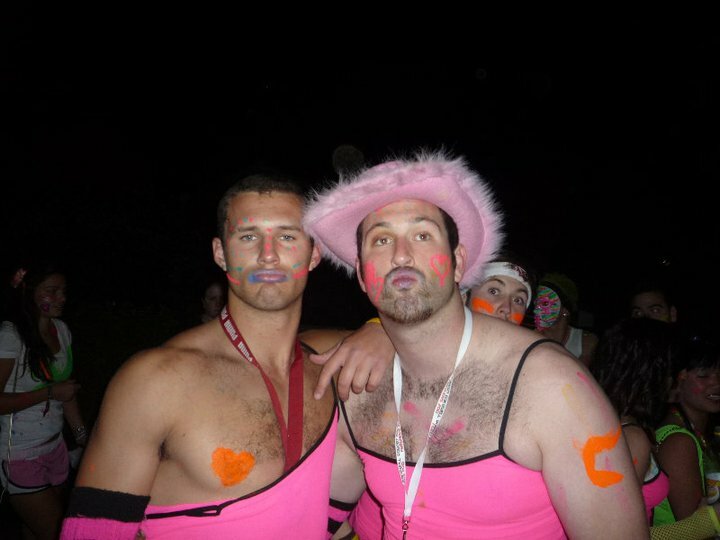 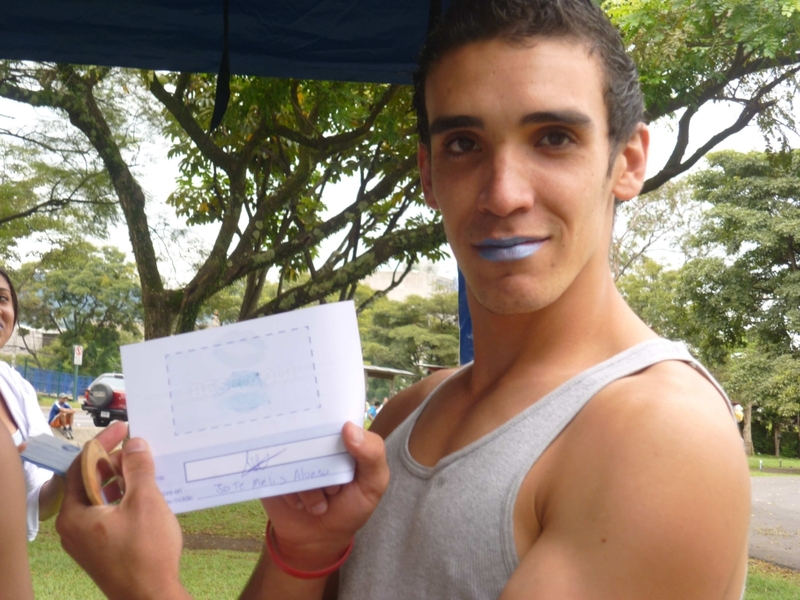 He says he is very grateful, for the reception the initiative received when introduced and that members of the league were happy to apply the lippy and give their kiss although, perhaps some were not as comfortable as others. 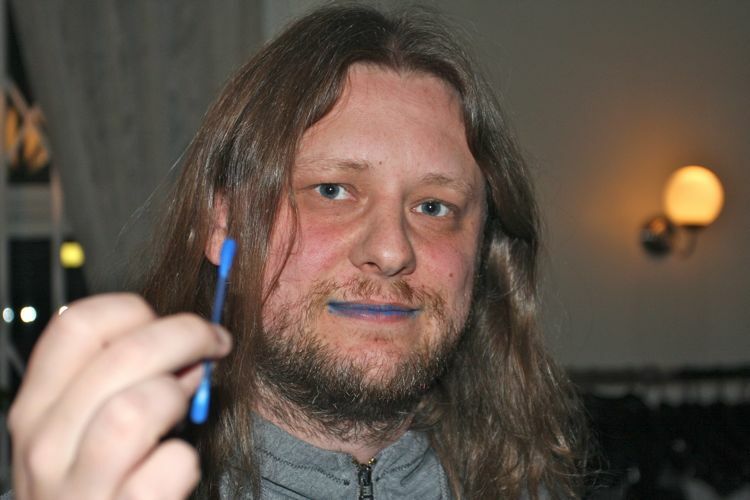 An article about PH and the campaign has today been uploaded to the Backgammon leagues website and further PuckerUp4PH events will also be carried out at upcoming tournaments. 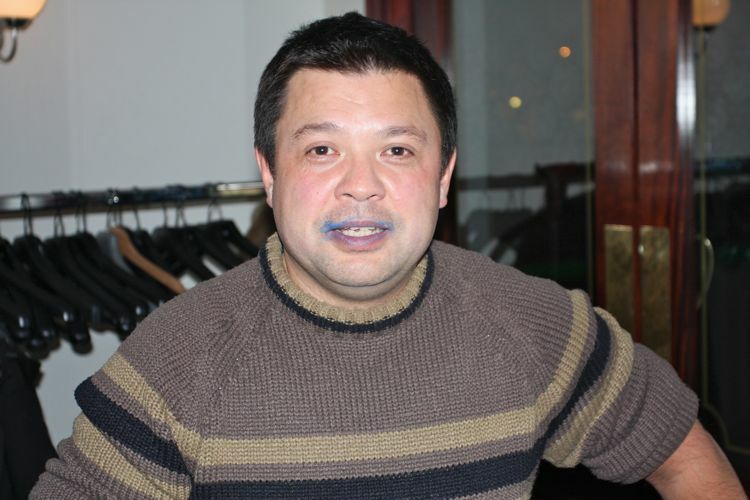 Hall’s son plays Basketball at a national level and enquiries have been made as to whether the team might play this Sunday, Halloween, in blue lips at a prominent game sure to attract members of the media – a great idea to get attention for not just the campaign, but for PH through Norway. 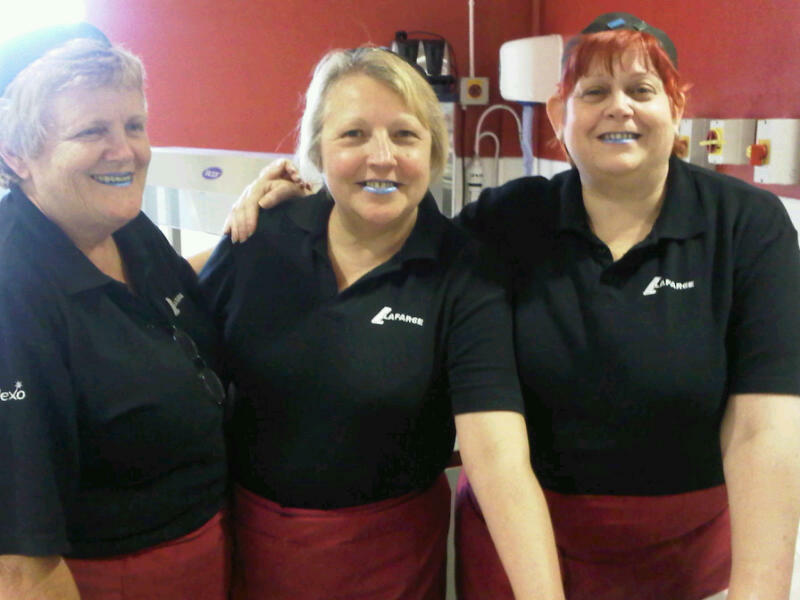 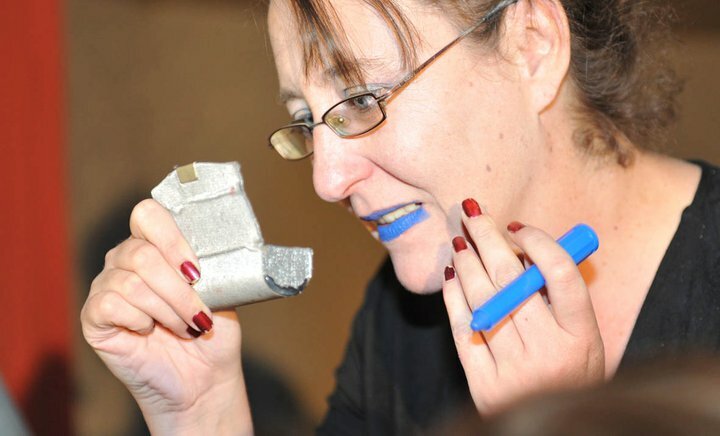 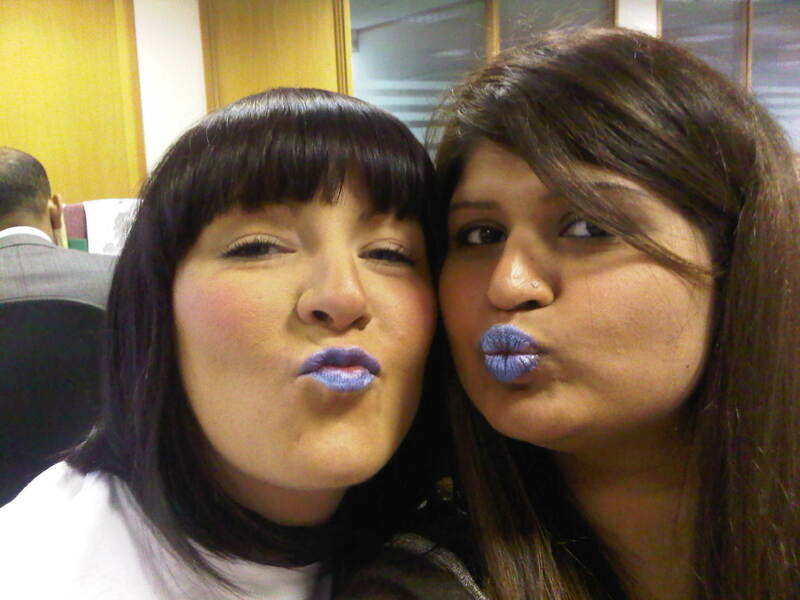 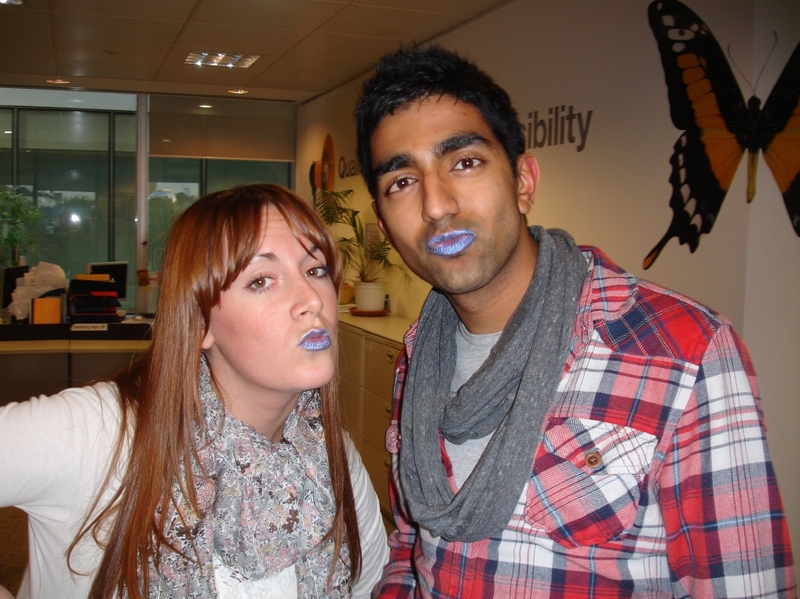 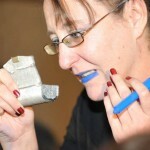 In the UK over 180 kisses were collected recently at Lafarge Aggregates Head Office in Leicestershire, with the Blue Lips spectacle prompting a lot of questions about the condition and the campaign. 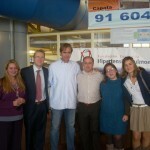 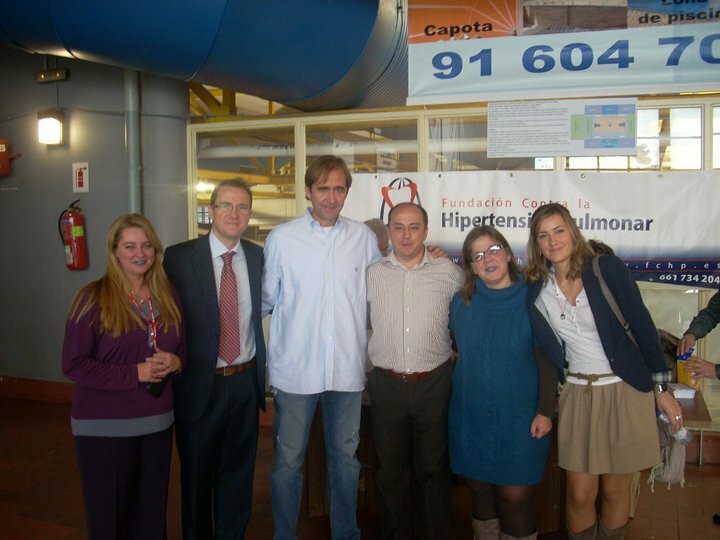 Over to Spain and the PH patient association Fundación Contra la Hipertensión Pulmonar (FCHP). 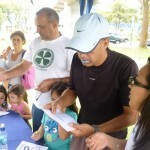 Although they joined the campaign a little later than some of the other associations, their enthusiasm and creativity has been outstanding and inspiring. 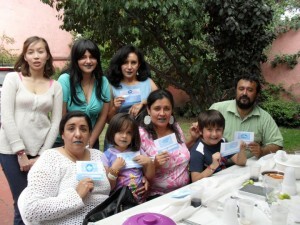 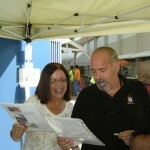 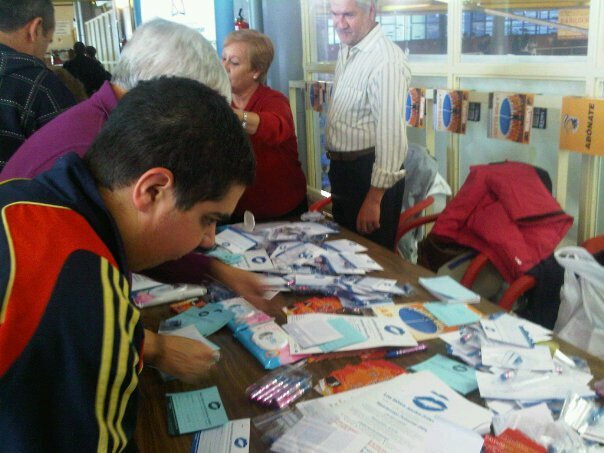 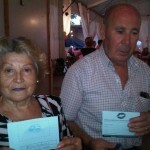 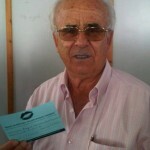 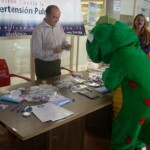 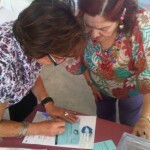 The council of the Municipality of Parla, near Madrid is a major supporter of the FCHP campaign having distributed entry forms and blue lipsticks amongst all of the council’s staff and set up three locations in the city, including a booth at Town Hall, where the general population can go to participate in the campaign. 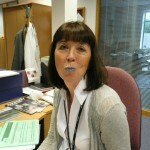 Even the local police have Puckered up 4 PH. 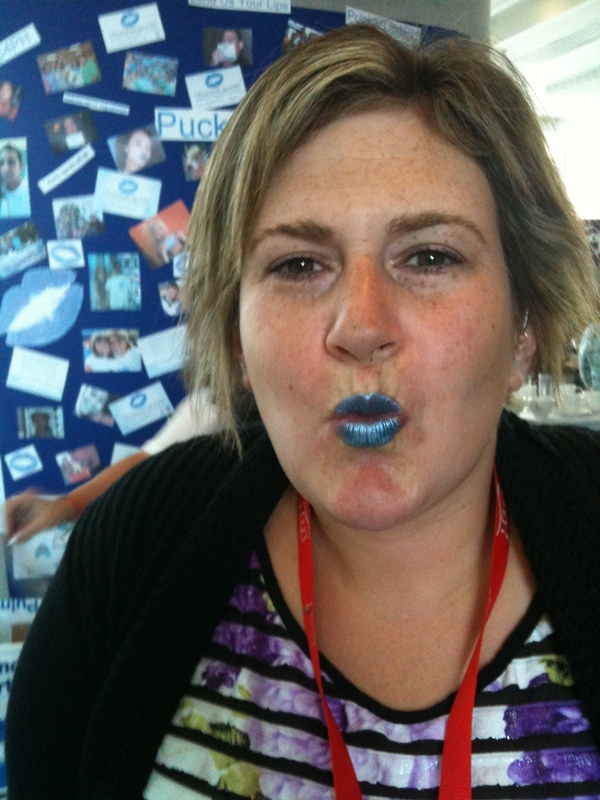 Alongside collecting as many lip prints as they can FCHP has secured a huge amount of media coverage and have introduced PuckerUp4PH at a series of large events, sharing information about the condition and collecting blue kisses. 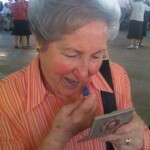 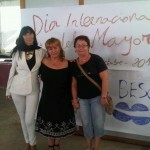 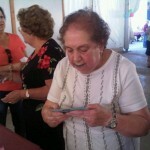 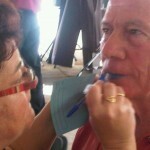 The International Day of the Elderly was recently celebrated in Parla with music, dancing good food and lots of Blue kisses. 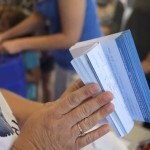 Over 500 blue collected on this day alone! 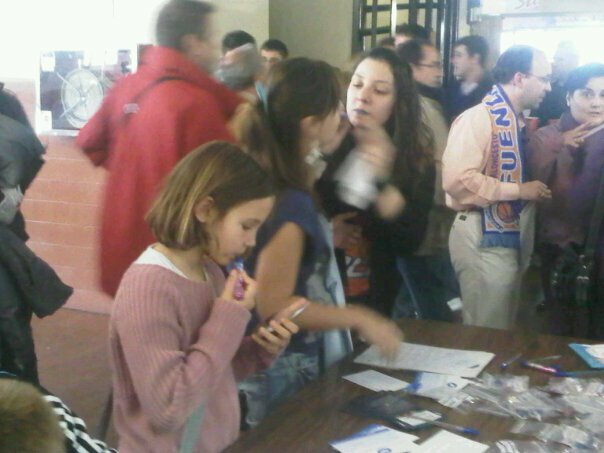 Our Spanish friends at FCHP are also collaborating with a professional basketball team “El Baloncesto Fuenlabrada” just outside of Madrid who have invited the association to collect kisses and speak to fans about PH at their next couple of games. 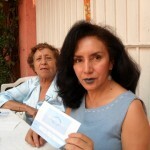 The campaign is also being promoted through the team’s website. 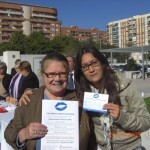 Olga Colman, a member of FCHP last week took her kits along to the “Day for Patients with Rare Diseases” at the General Hospital of the city of Valencia in a continuation of her campaign in the area. 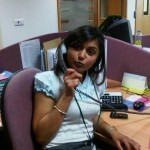 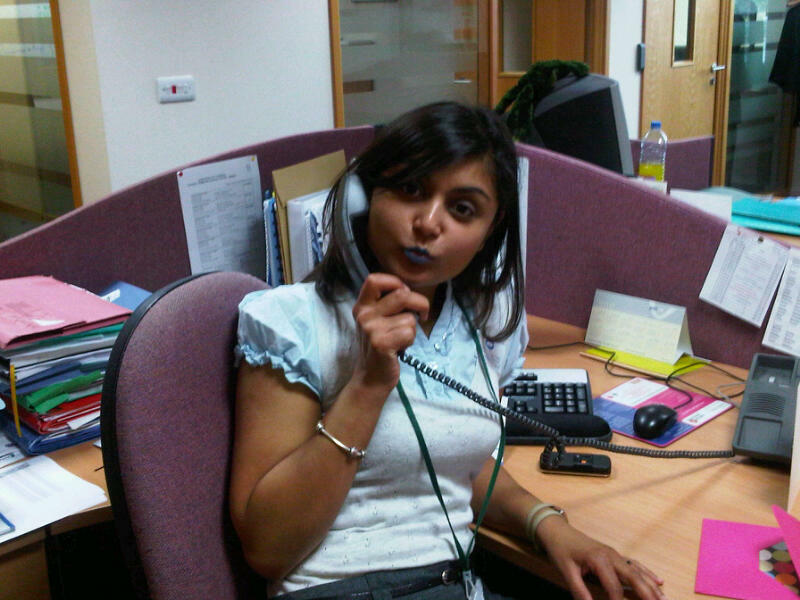 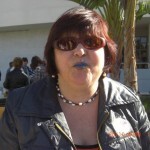 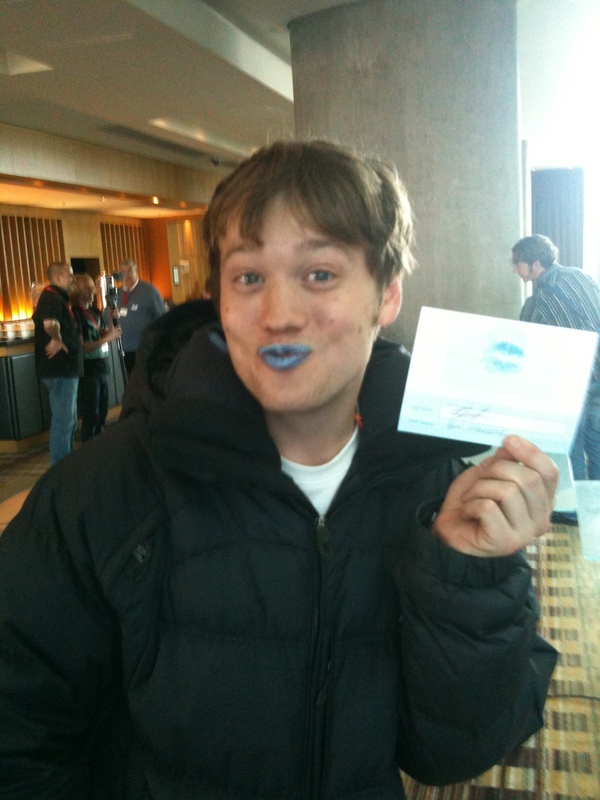 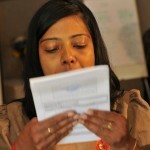 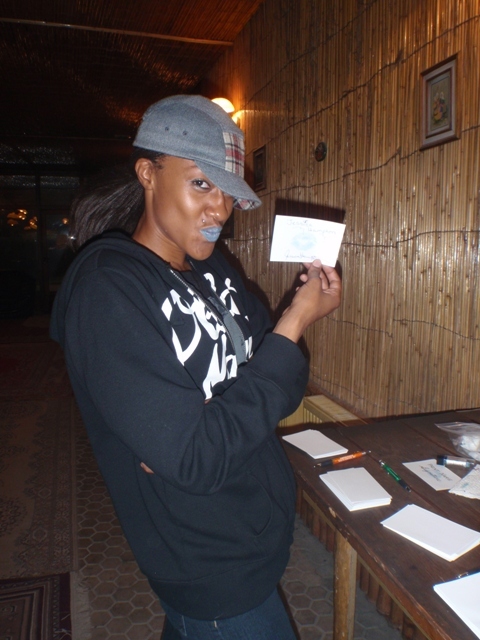 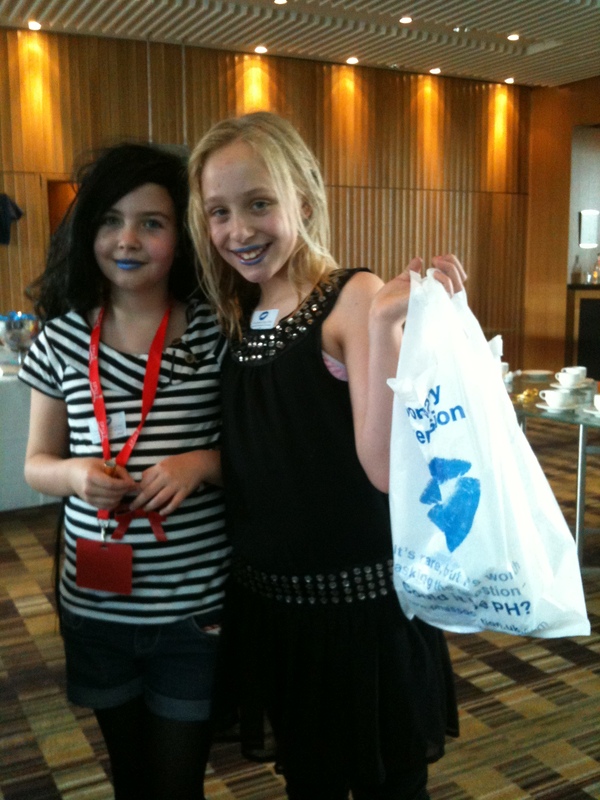 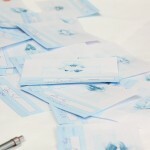 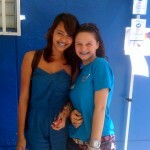 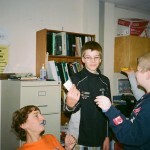 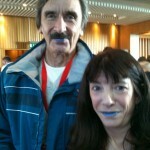 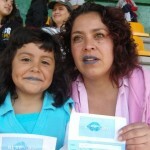 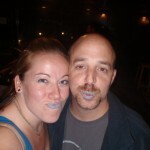 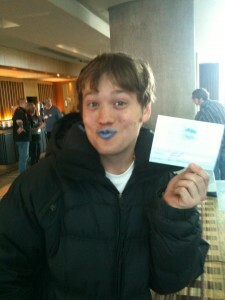 She reports that a lot of interest was generated this day which should result in the collection of further blue kisses! 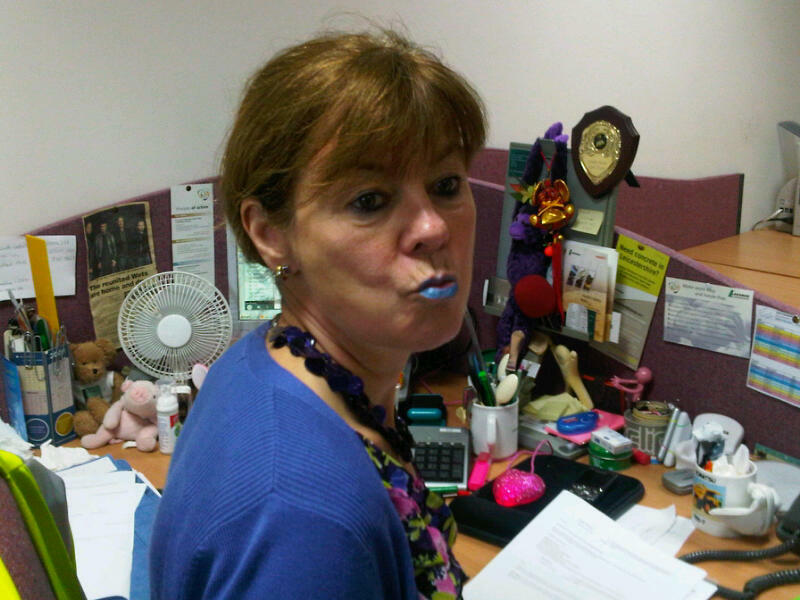 Over to the USA, or rather to Afghanistan, where Jocelyn Cavendar has been working to collect blue kisses and increase awareness of PH with fellow employees from Comprehensive Health Services who provide on-site medical care for Air Traffic Controllers and their support auxiliary staff in Kabul. 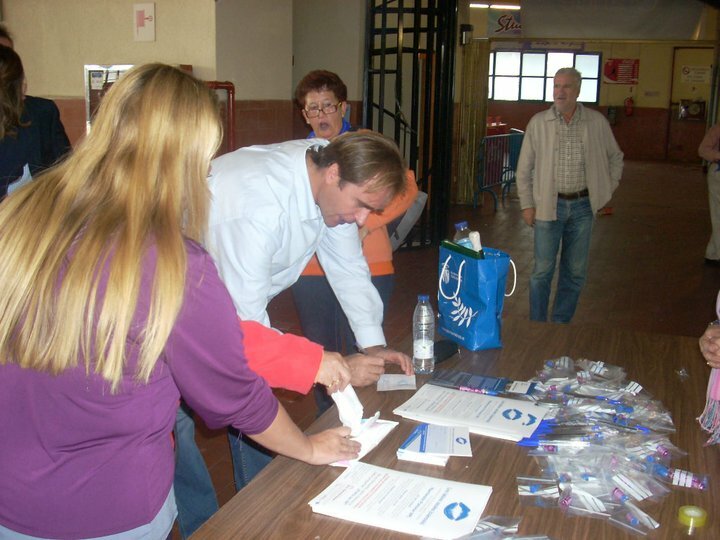 Jocelyn has been inspired by her friend Sean Wyman, a member of the PHA in the USA, to organise several awareness events at the Moral, Welfare and Recreation centre and has kindly translated the materials into Russian for the Russian and Balkan members of the team. 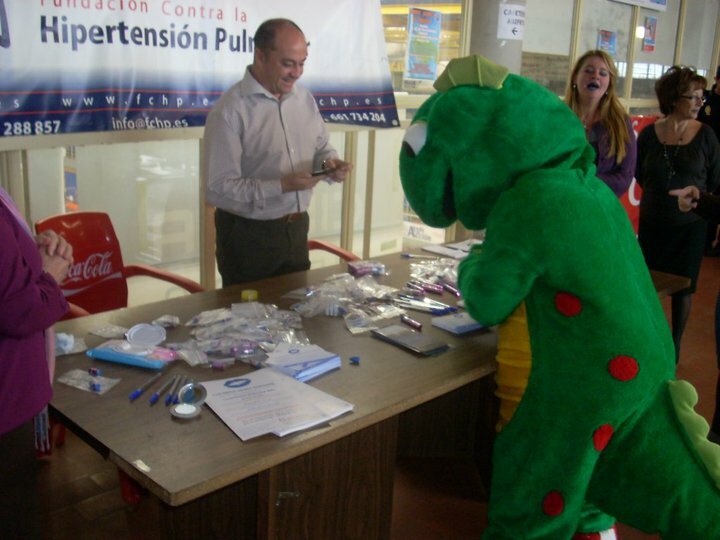 In Mexico, the campaign has really taken off thanks to the efforts of both the PH patient support groups as well as individuals. 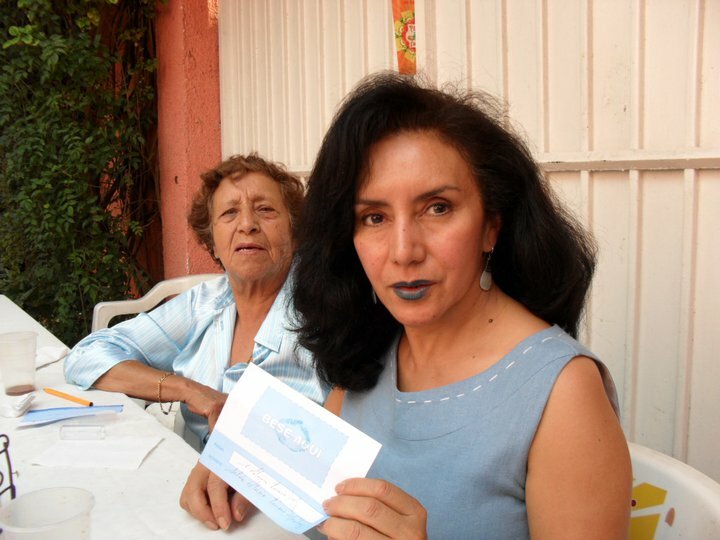 One lady in particular, Silvia Galvan has been working particularly hard to promote the campaign and PH awareness in every sphere of her life. 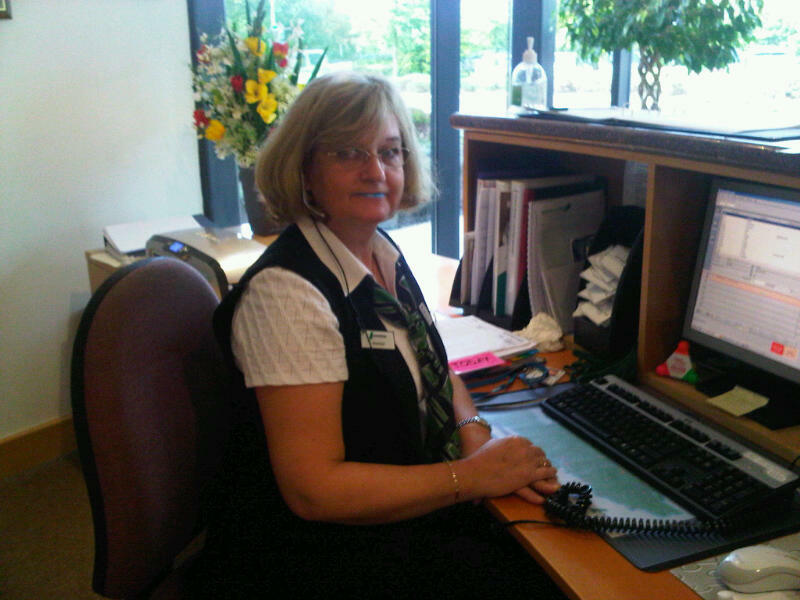 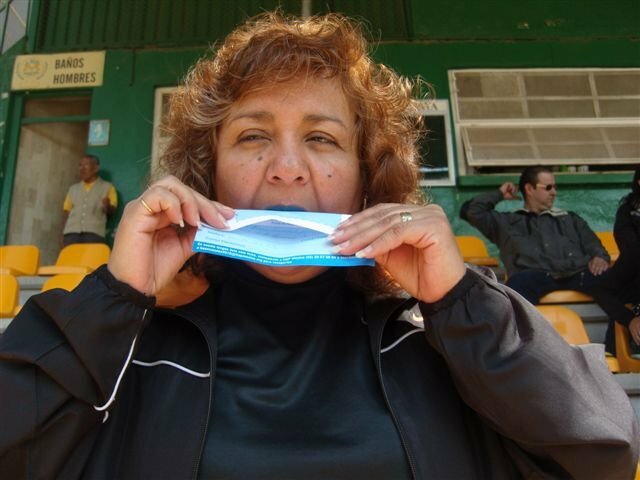 In addition to spending time with a local Scout group, persuading local cinema staff to get involved, working with schools in the area and puckering up at sporting events, Silvia even opened up her home to friends, family and colleagues over several days. 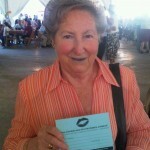 She has collected an astounding 600 kisses already – and she’s still going! 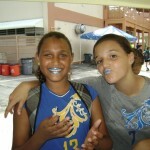 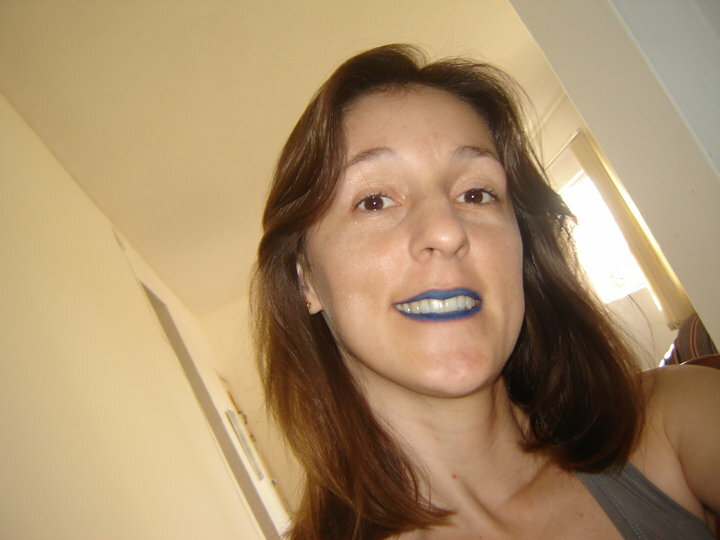 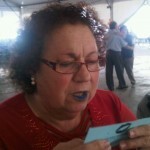 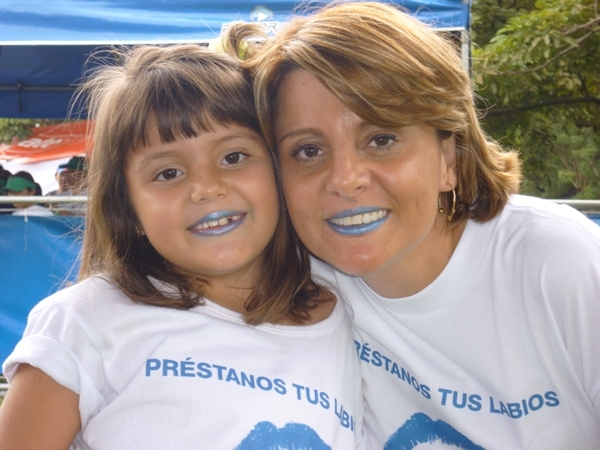 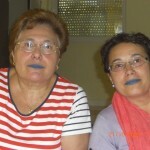 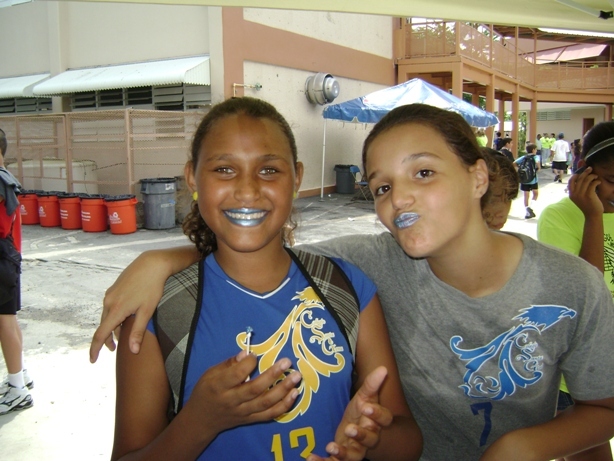 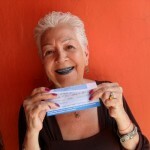 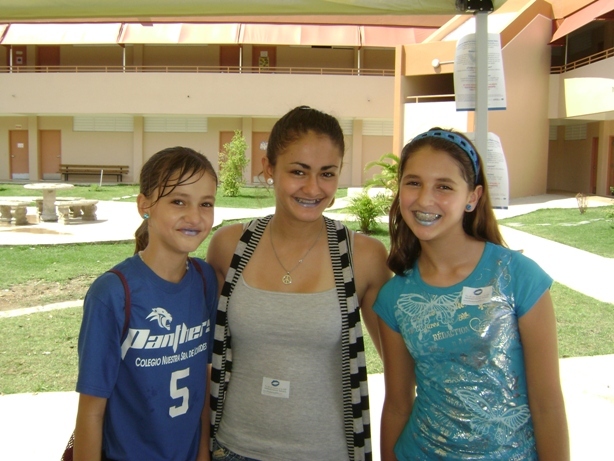 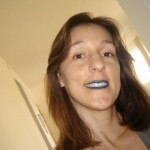 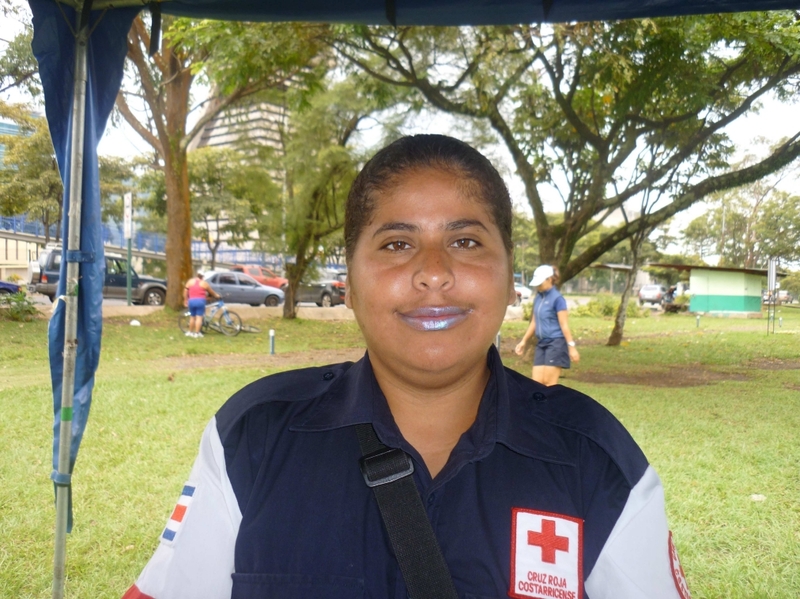 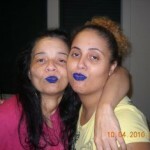 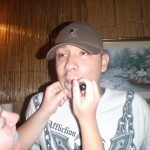 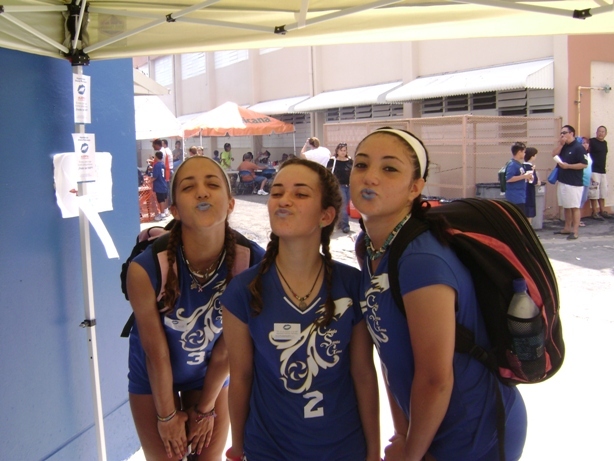 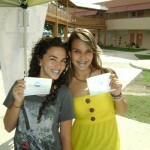 The Puerto Rican support group GAPHPPR led by the “Lips of 2010”, Luz Batista-Santiago, have continued their inspiring work and have once more taken the lead in the Blue Lips tally. 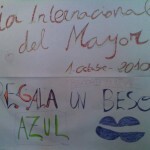 They have a confirmed count of 4731 kisses, but believe that once all the kisses are returned to them from their members and supporters their actual number could be in excess of 7000 kisses. 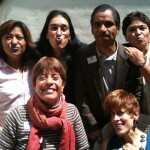 Their latest PuckerUp4PH activities include two separate schools whose students contributed 300 kisses each to the effort – In one of the school’s the celebrations being led by Luz’s own aunt Mrs Alma Santiago. 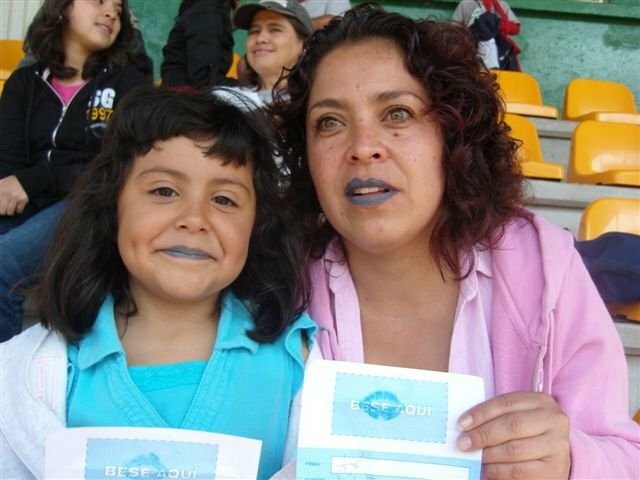 In another school at a volleyball tournament, one of Luz’s colleagues, Brenda Diaz, worked with her husband, daughter and mother in law to gather a further 208 kisses from the players, students and faculty. 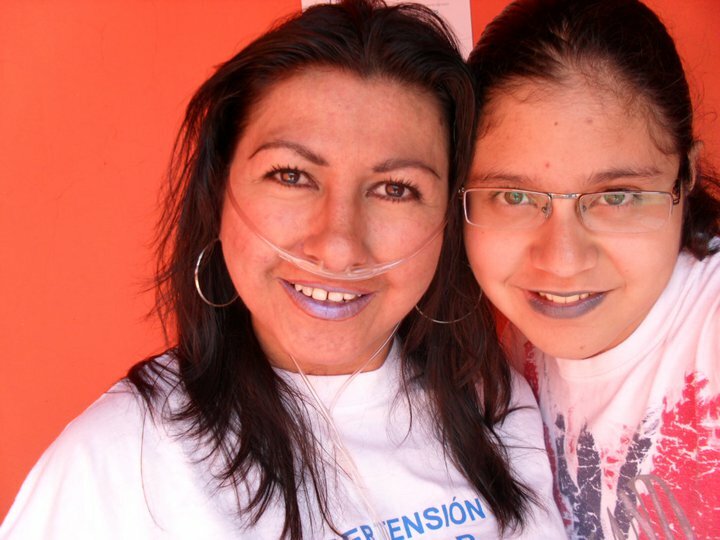 Luz also tells us that thanks to the media coverage they have worked to get over the last couple of months they have had enquiries from other schools and organisations wanting her to come and speak to them and help them participate in the campaign! 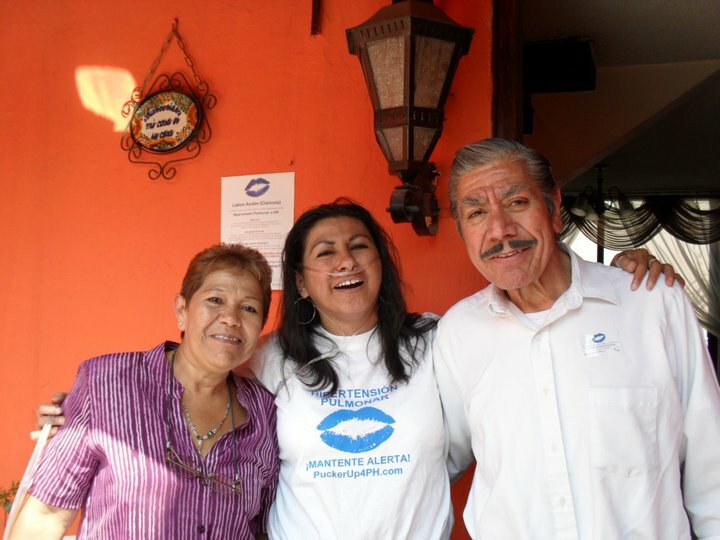 And finally: Central America has joined the campaign in a spectacular way co-ordinating an extensive media campaign to reach as many people as possible, achieving coverage on TV, radio and in newspapers and magazines. 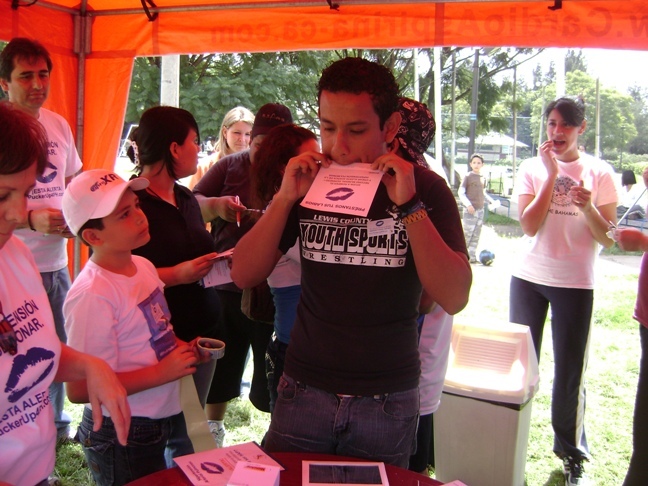 They simultaneously hosted prominent public events in the likes of Costa Rica, Honduras and Guatemala to allow as many people as possible to participate in the Guinness World Record attempt with a stunning 1675 kisses collected in one weekend between the three countries. 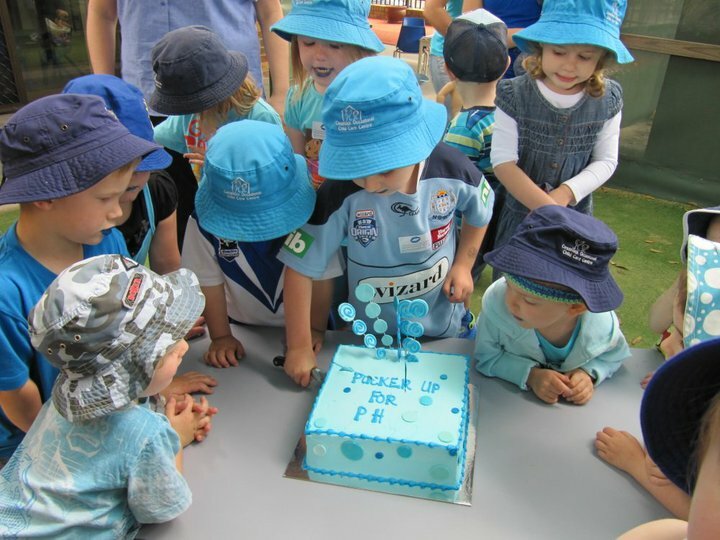 Thank you to everyone who is keeping us in touch with events and initiatives. 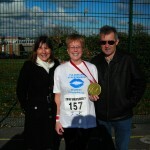 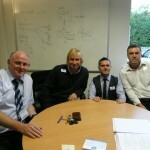 We will be posting a round up of photos and news presently. 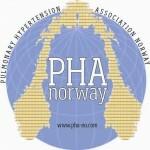 PHA-UK who initiated this campaign and who are working closely with PHriends from Ireland, Canada, USA, Mexico, Spain, Italy, Germany, Norway, Poland, Argentina, Brazil, Australia, New Zealand, Puerto Rico, Costa Rica, Honduras, Guatemala, Israel, Singapore, Asia and South Africa have their annual conference across Halloween Weekend in Manchester. 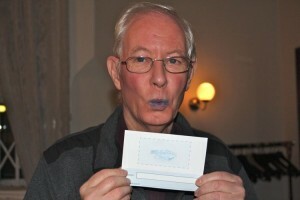 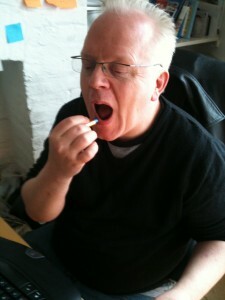 Pucker’s Manchester based colleagues will be attending and hoping to add another few hundred kisses to the tally. 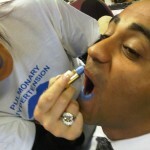 As those of you who have visited this blog before will know, the Pulmonary Arterial Hypertension community and its friends and supporters across the 4 corners of the earth are working together to get more people to be aware of this serious and rare lung condition and in the process of doing so, are looking to collect 40,000 Blue Lip prints to set a new World record. 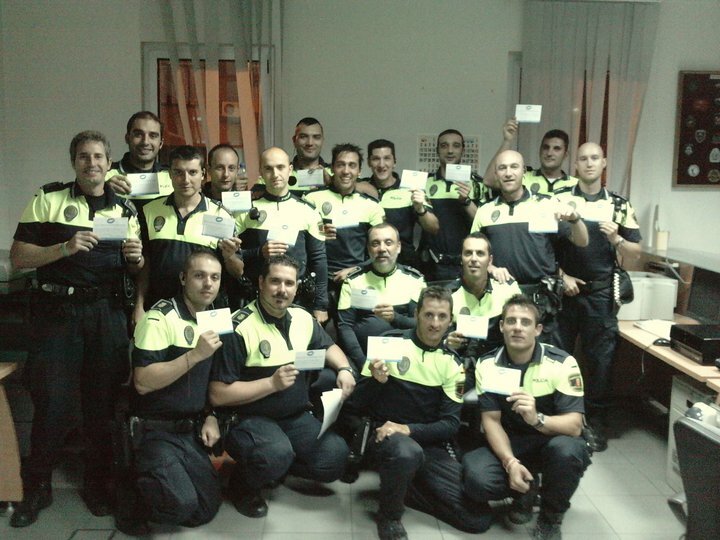 If you are happening across the site for the first time we’d encourage you to look back at some of the truly special things that have happened from Ibiza to Israel as part of this PHA-UK led campaign. 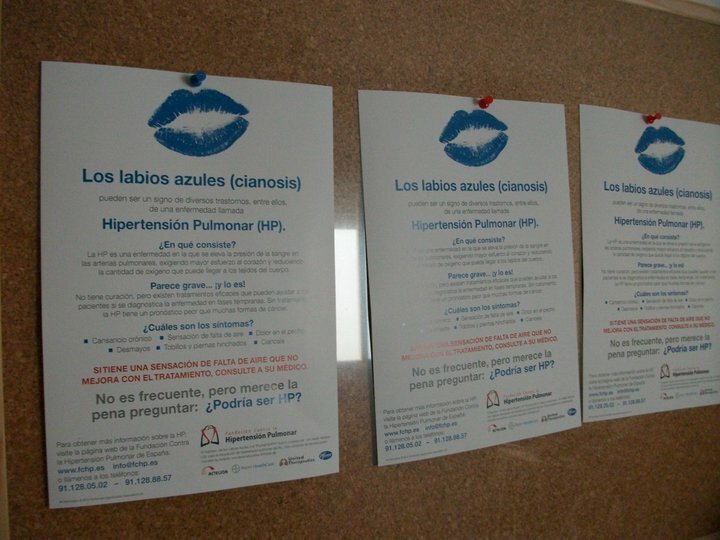 It is so, so wonderful to see such a simple idea catch light across the world and to hear the experiences of each group/patient associations who are doing so much to make this campaign so effective. 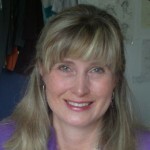 Christine Dickler from the PHA in the US, explained to us how the campaign is taking shape there,’ The campaign has been incredibly effective not only in energizing our members, but in creating opportunities to invite their communities to ask them about their illness. 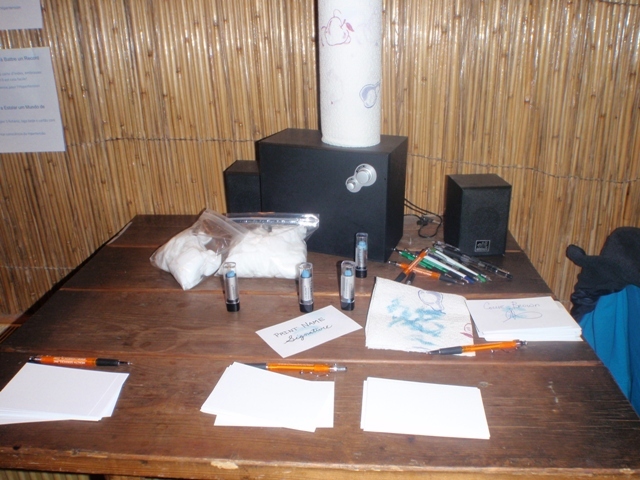 It’s not uncommon for curious neighbors to keep their questions to themselves in an effort to be mindful and polite, but for so many patients, it’s a relief and a bit of a gift to have the chance to inform their communities about PH and what they live with. 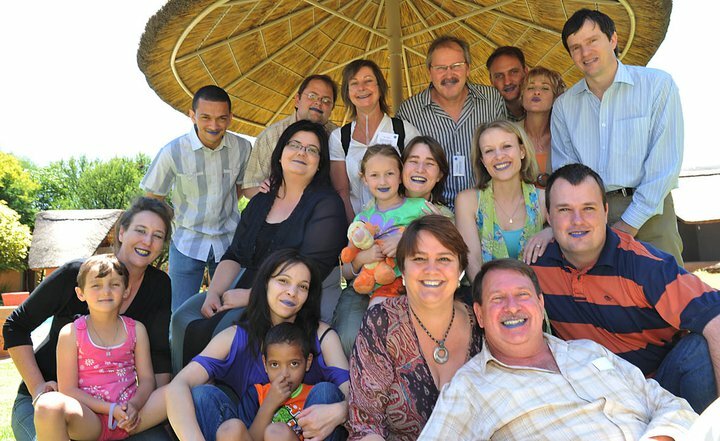 We’ve heard great stories of family members and friends taking hold of the campaign and bringing it out into their own communities, virally. 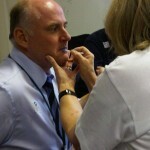 I think it’s helped many patients take a bit of ownership over their illness. It’s certainly been keeping us busy over here”. 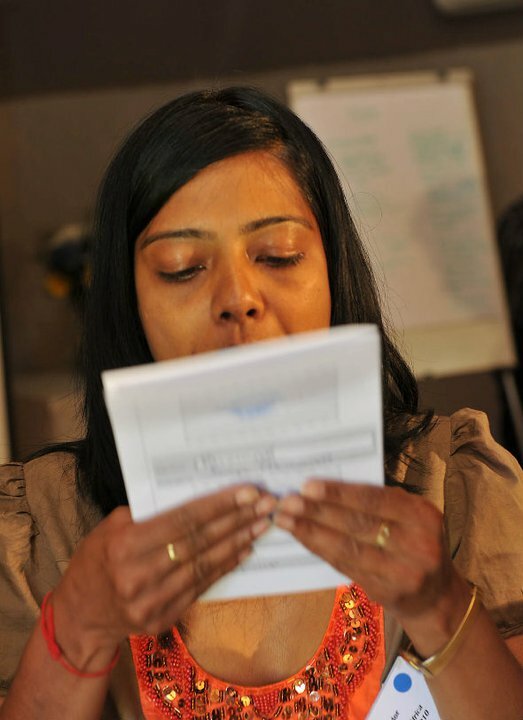 This is music to the ears of the PuckerUp4PH team, as empowering people to share their experiences of this condition is a key objective of the campaign. 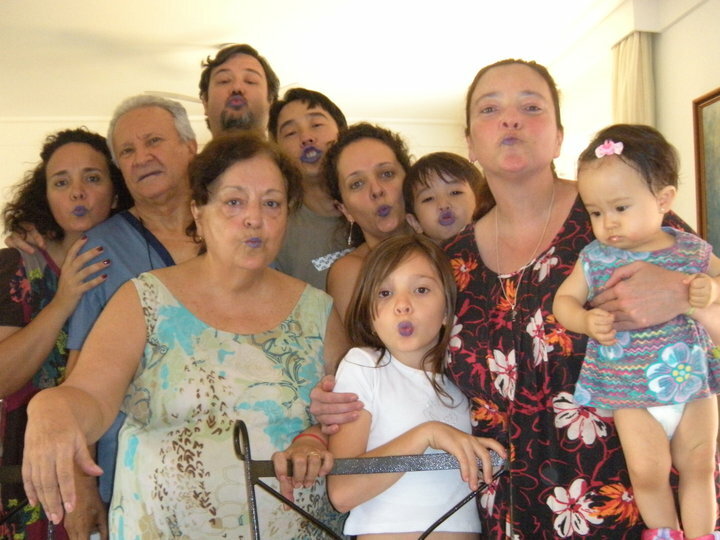 As of course is celebrating life and as you’ll see from the photos below we’ve certainly been acheiving that. 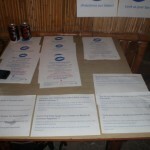 Next week, we’ve got a whole host of happenings from across the World to share with you, so we hope you can visit us once again. 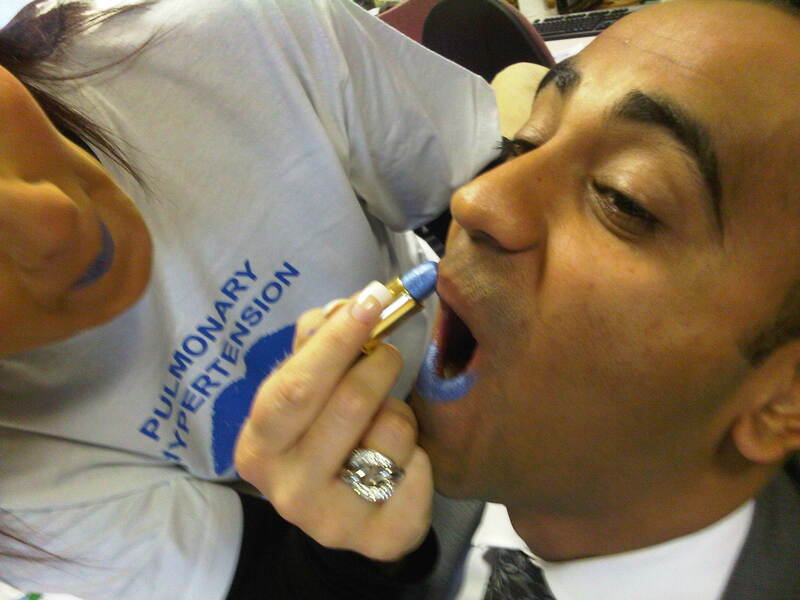 Whilst you are here why not find out more about PH/PAH, have a look at some of the patient films, you can even show your allegiance by buying some of our blue lip merchandise, with all profits going back into the campaign. 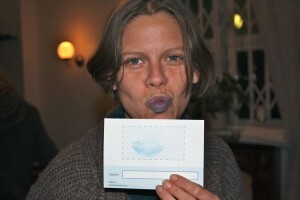 ..and before you leave…please print off one of our entry forms, put on lipstick (it doesn’t have to be blue) kiss the form, add you name and signature and send it back to one of the participating associations…it could be your kiss that makes the difference in our World Record attempt!! 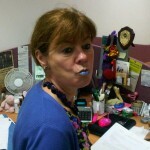 A quick trip around the World PuckeringUp4PH! 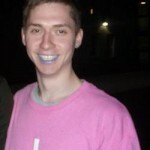 So much has happened around the world in the last month we just haven’t had the time to update you on all the Blue Lips PH awareness events taking place literally everywhere! 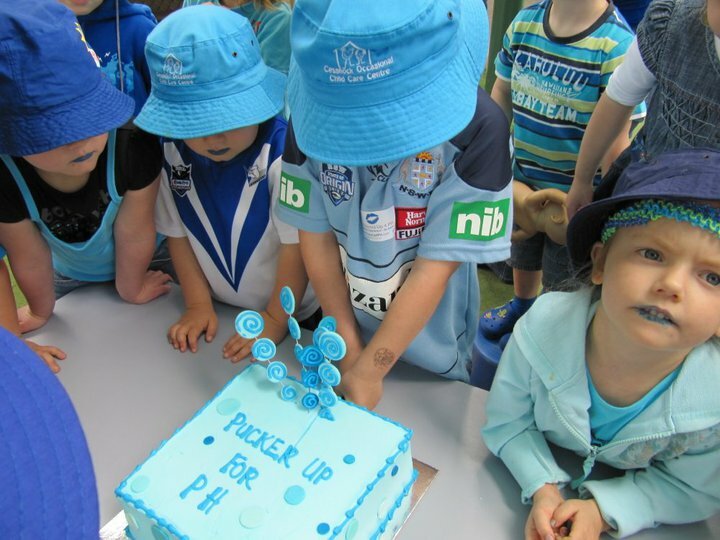 Here’s a quick A-Z roundup of the latest news and great photos that have come in from PHers all over striving together to set a new Guinness World Record TM. 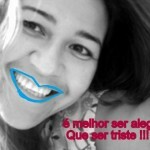 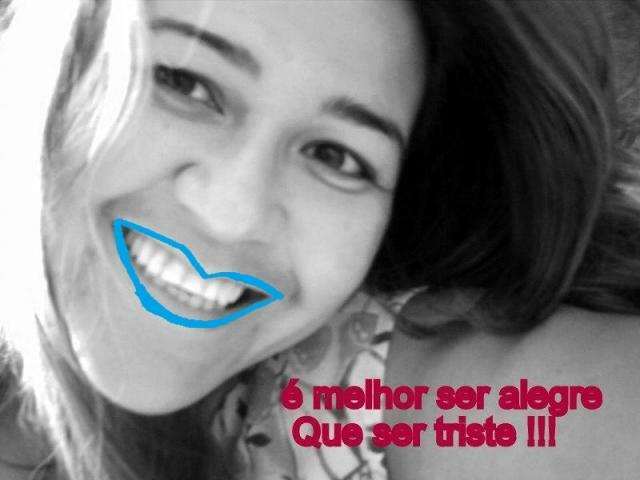 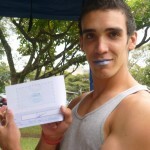 BRAZIL is putting out the call for Blue Lips collections and families and friends of PHers there have downloaded entry forms from the internet to participate. 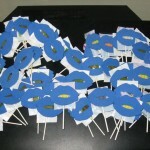 CANADA – Edmonton PAH Society collected 110 kisses at the University of Alberta Hospital and has two more events planned there! 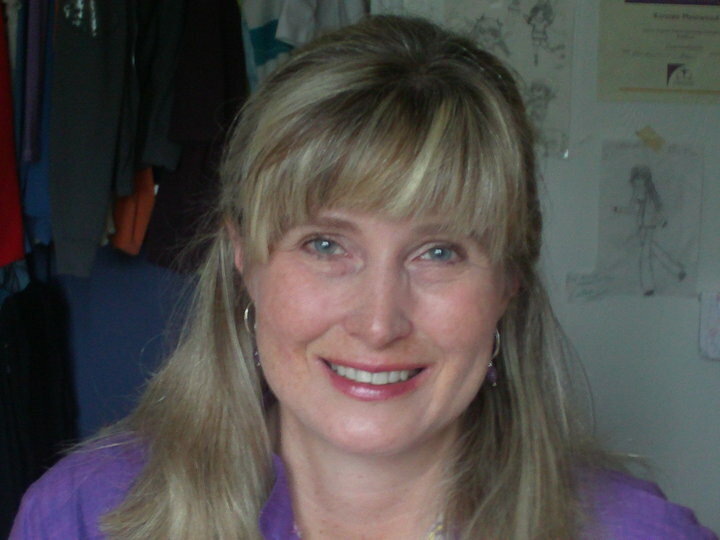 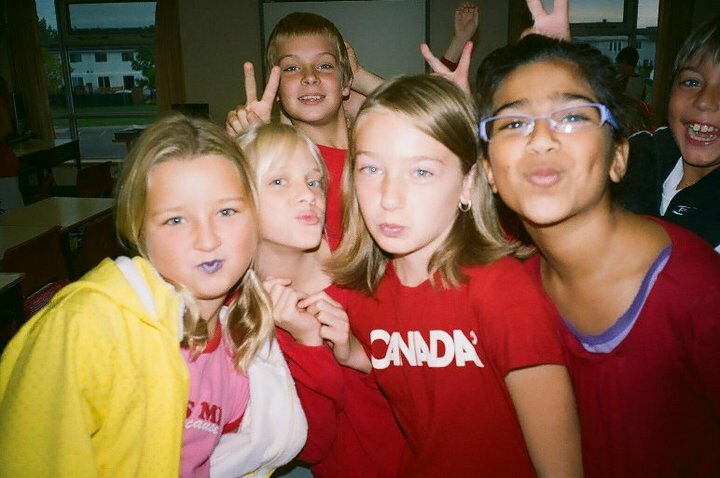 While Jo-Anne Mainwood in Ottawa has collected more than 500 kisses including those from the school she teaches at, Trillium Elementary, and she has three more schools queueing to PuckerUp throughout October and November. 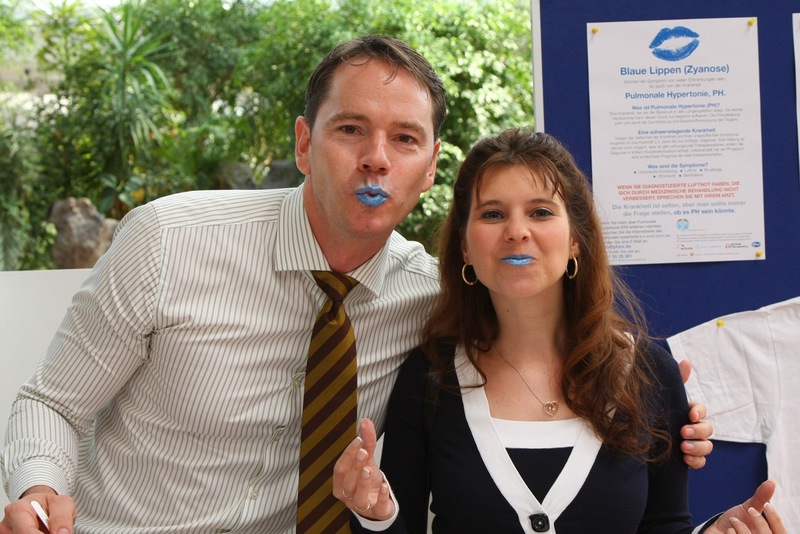 GERMANY – Bayer have carried out a second round of PH awareness actions collecting an additional 233 blue kisses at an internal Health awareness day. 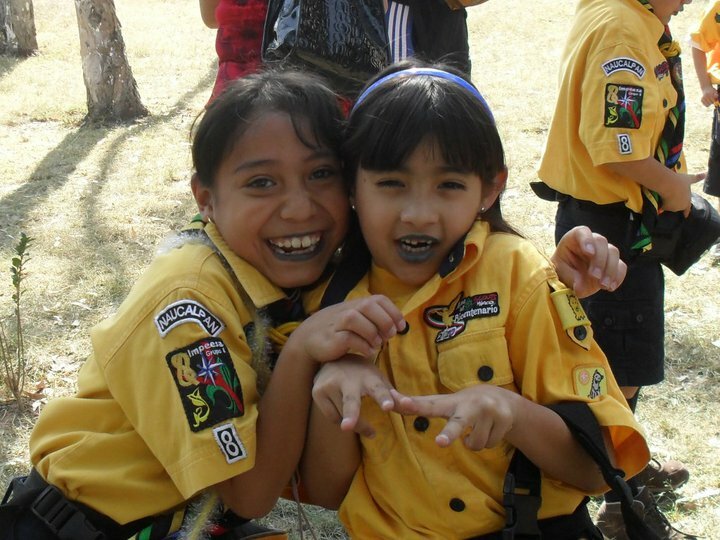 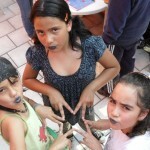 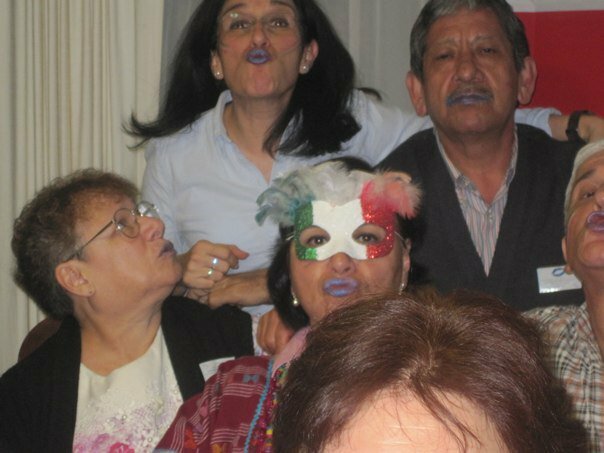 MEXICO is going mad for Blue Lips Puckering Up on Independance Day, at parties, in Universities and even hosting collections in coffee shops! 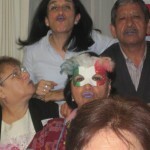 The “I Have Wings” group composed of friends with a wide range of disabilities also supported their friend Adriana Posada at a recent workshop. 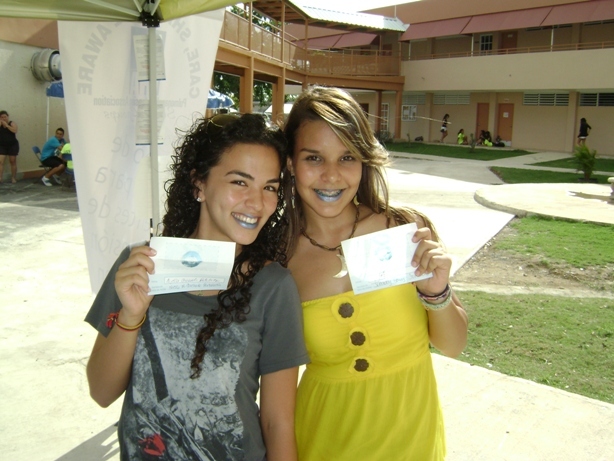 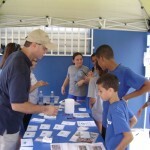 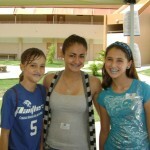 PUERTO RICO: The students of the Daskalos School collected 286 lip prints in one day! 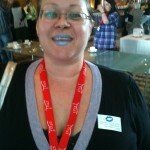 UNITED KINGDOM: Tracie Pannell collects more than 400 kisses in one afternoon at Tesco Supermarket Exmouth. 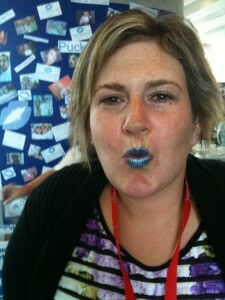 One of Jacqui Boldy’s PuckerUp4PH banners makes it to the ERS congress in Barcelona with the Papworth PVDU Team. 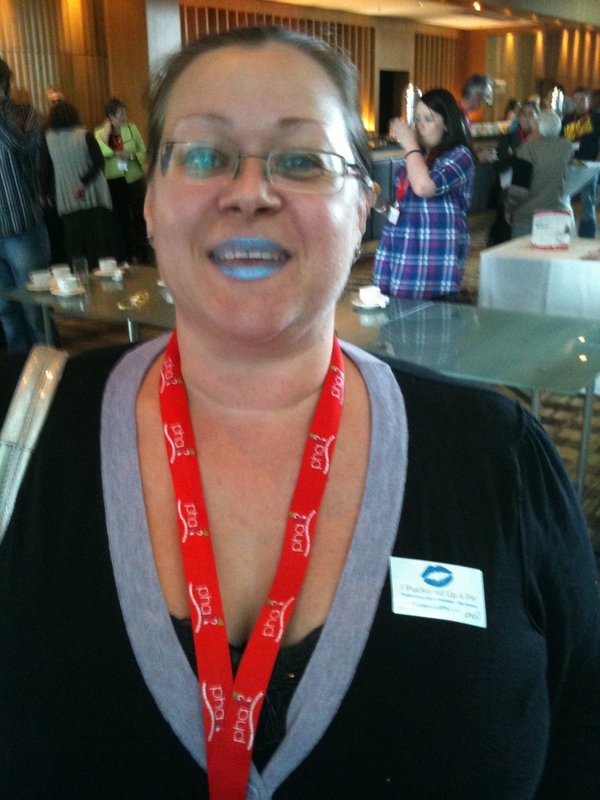 Lucinda Duxbury-Smith mans another Blue Lips booth at the Disability Road Show in Kent. 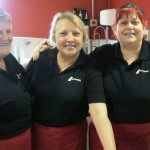 Hannah Perry, friend of Jenny Leafe, had everyone from the Directors to the canteen staff of Lafarge Aggregates Limited PuckeringUp4PH. 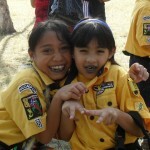 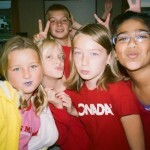 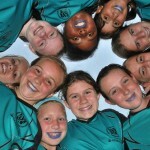 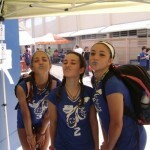 USA: Friends of the Katie-Grace Groebner including the Piranha’s Football team have been PuckeringUp in California. 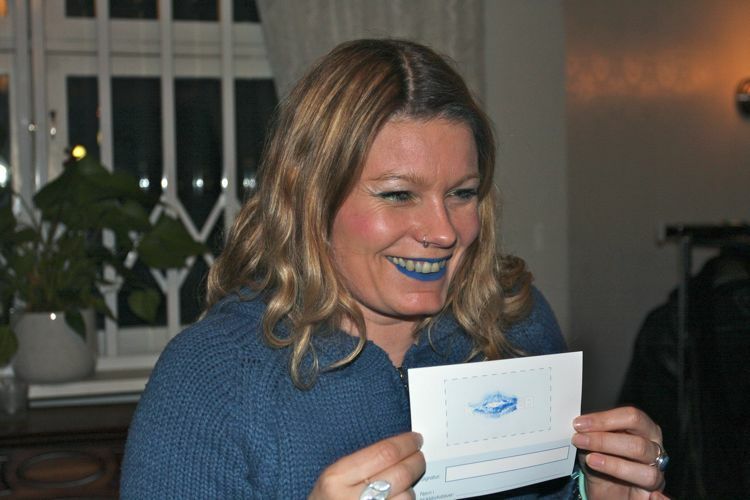 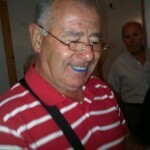 Shelly Carder in Illanois has a host of dates manning Blue Kiss Booths in Illanois (100 kisses plus and counting!). 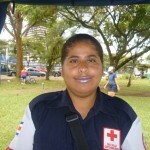 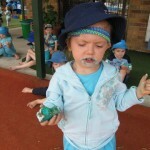 Misty Angeley is collecting kisses in her community. 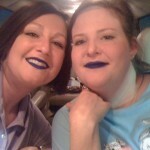 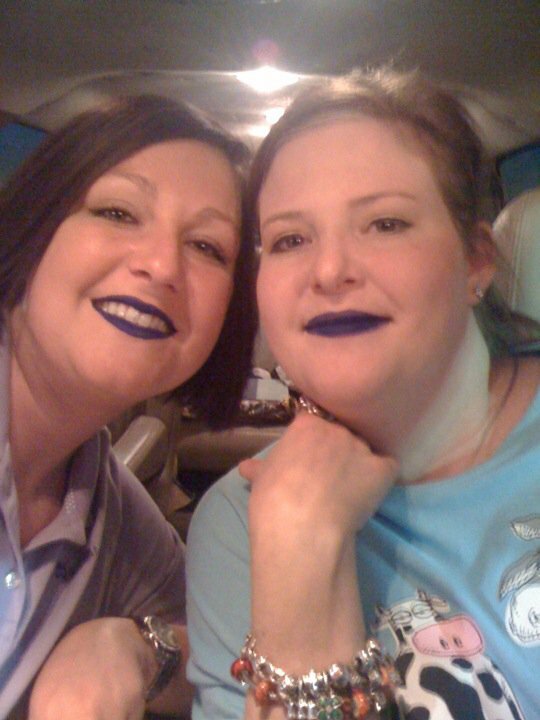 Beverley Richardson’s family all went blue to support their recently diagnosed Mom! 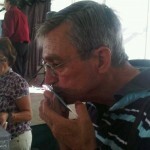 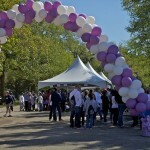 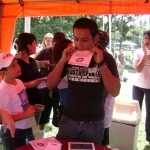 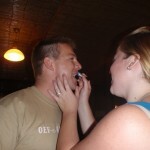 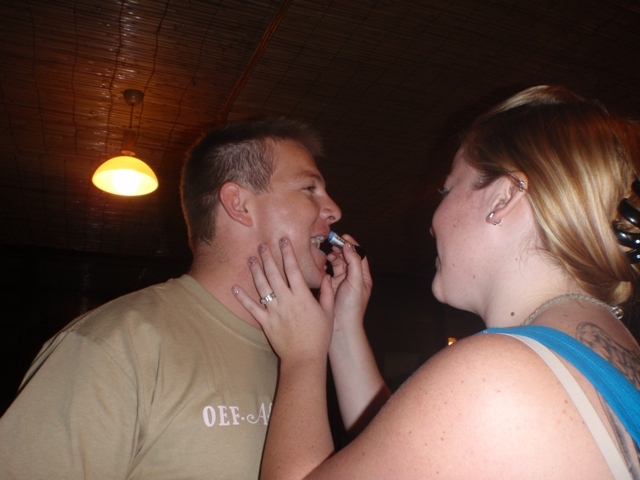 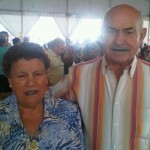 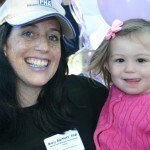 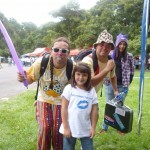 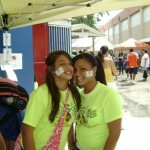 The NY Funwalk was hugely successful, raising funds for the PHA and contributing 158 kisses to the initiative. 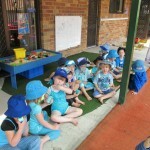 Aussies Go Blue 4 PH! 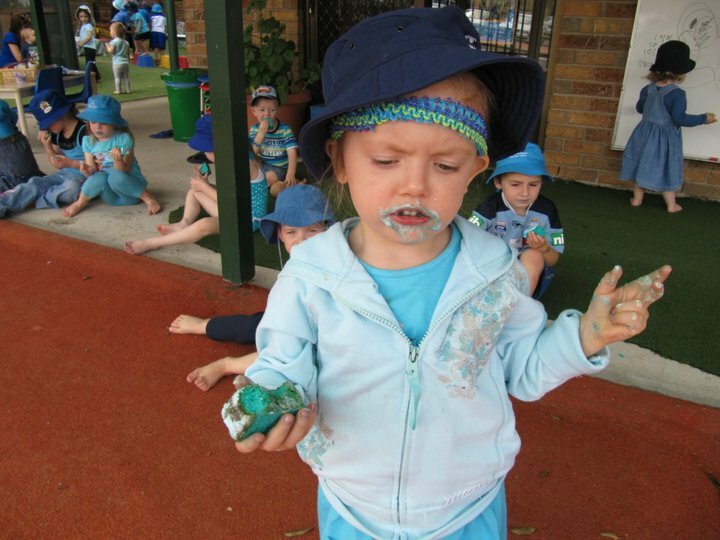 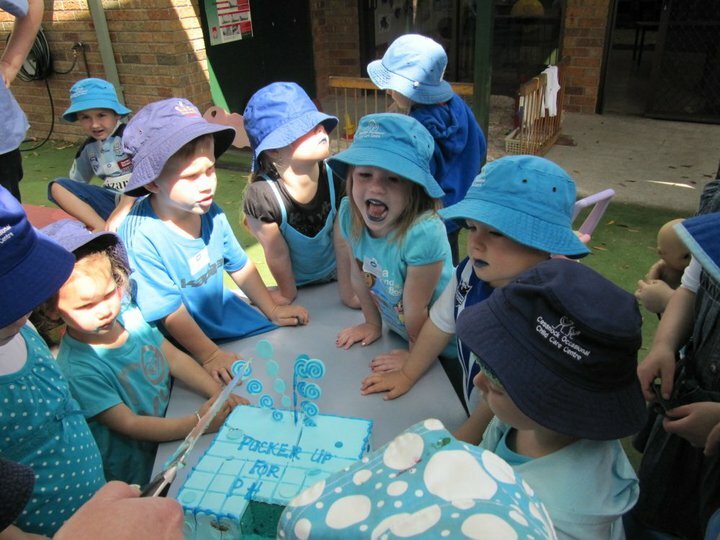 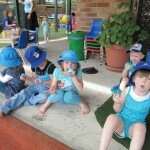 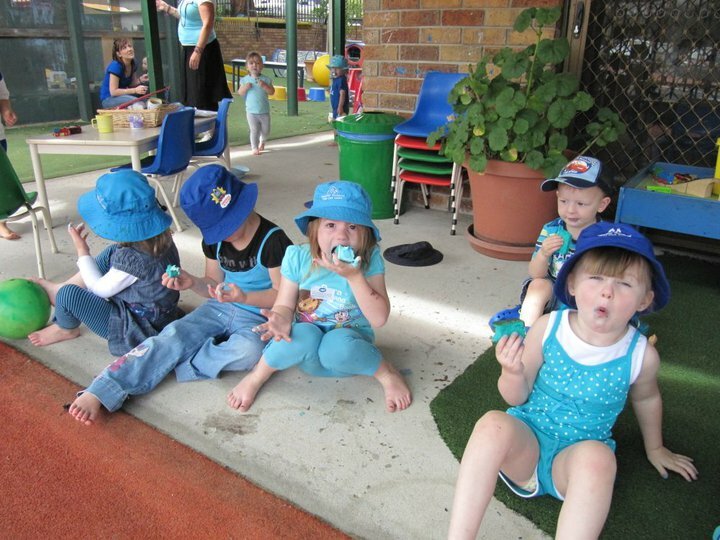 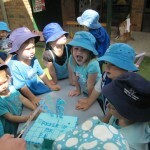 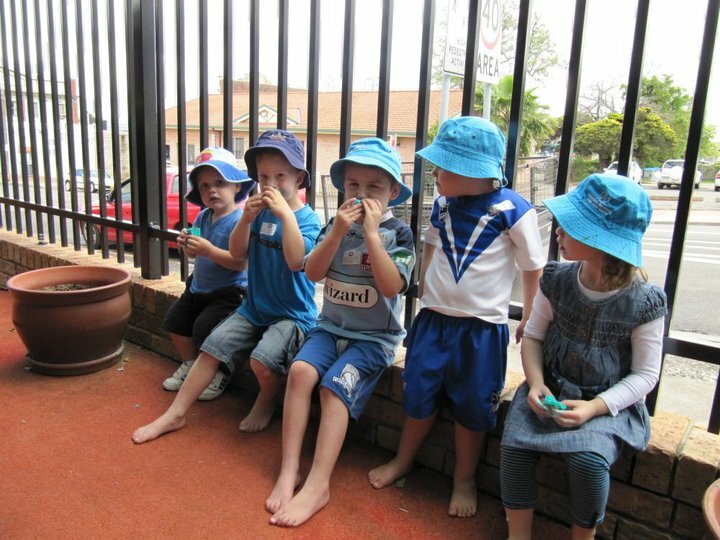 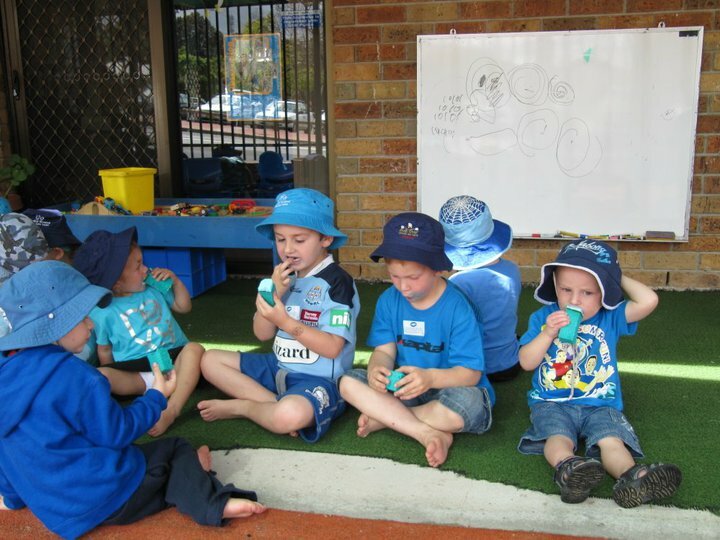 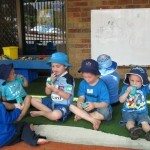 All this week at Cessnock Occasional Child Care Centre in New South Wales the kids will be donning their best blues in support of the PuckerUp4PH campaign to set a new Guinness World Record and raise awareness of PH. 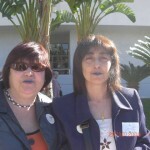 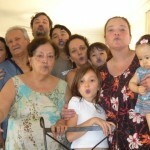 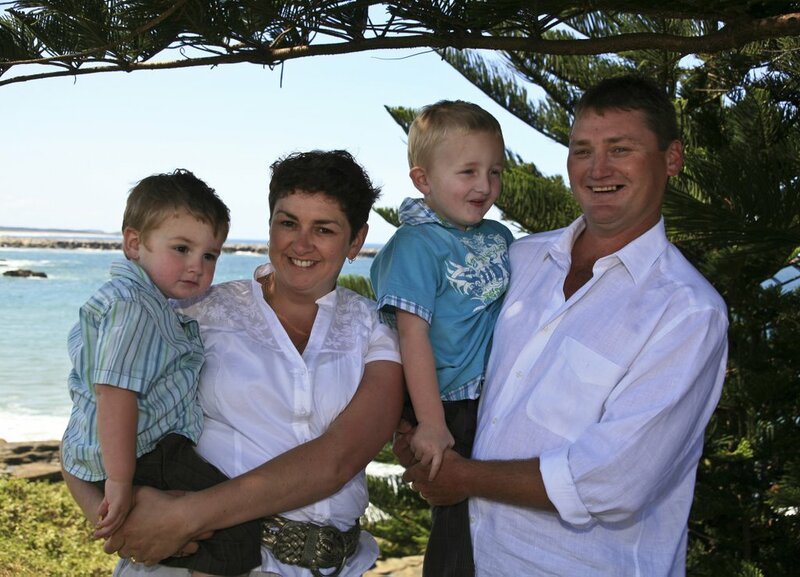 The PuckerUp4PH campaign was introduced to the centre by the McGlynn family who are active members of PHA Australia. 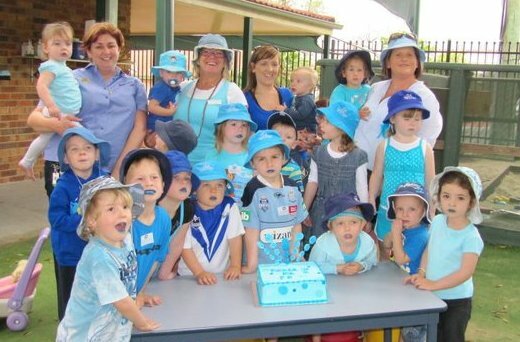 This is the latest in a series of inspirational awareness events the family has organised to celebrate the life of their little boy, Thomas. 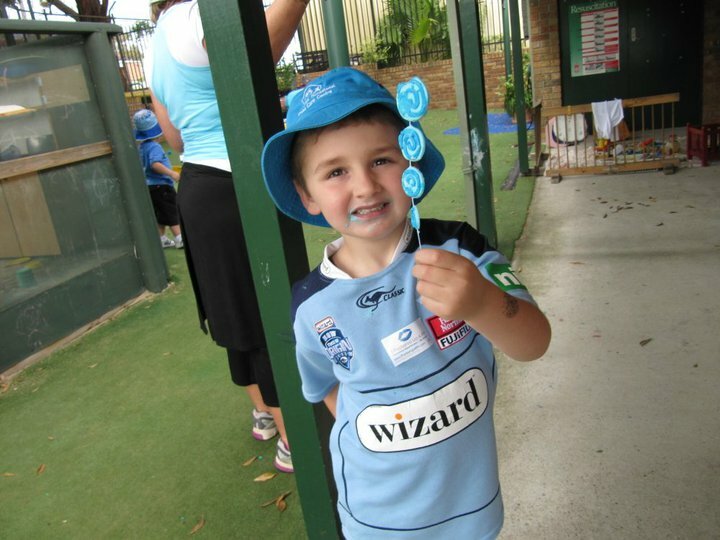 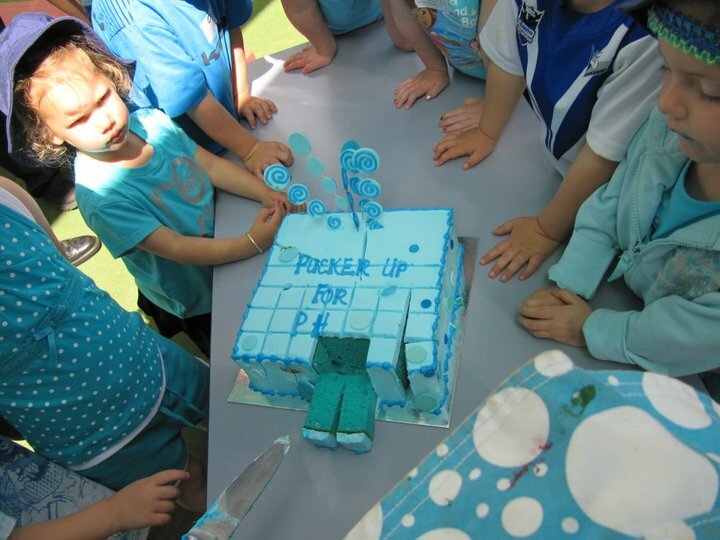 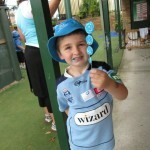 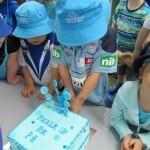 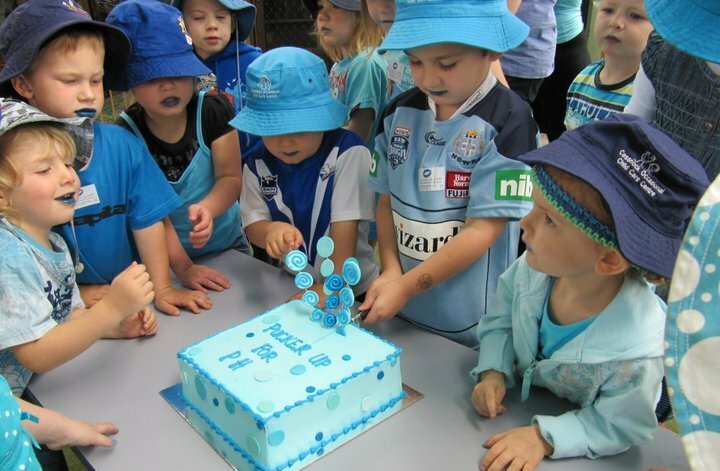 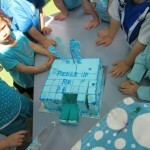 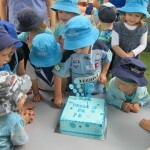 Young Mitchell McGlynn proudly led the other little ones wearing his New South Wales Blues State of Origin jersey as they had their lips painted blue, created their lip prints and consumed blue pancakes before cutting into a gorgeous blue PuckerUp4PH cake to mark the occasion. 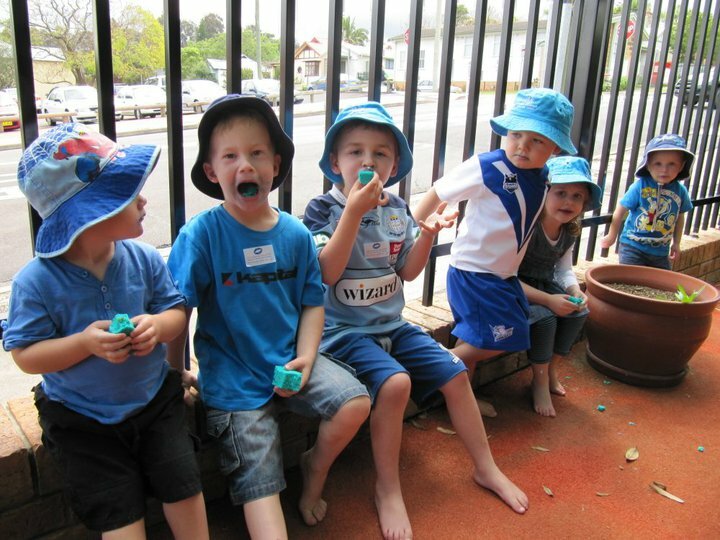 The kids have reportedly been revelling in the event and although many had already Puckered Up and kissed their entry forms earlier in the week, they all lined up excited to have their lips painted again before having their photo taken for local newspaper, the Cessnock Advertiser. 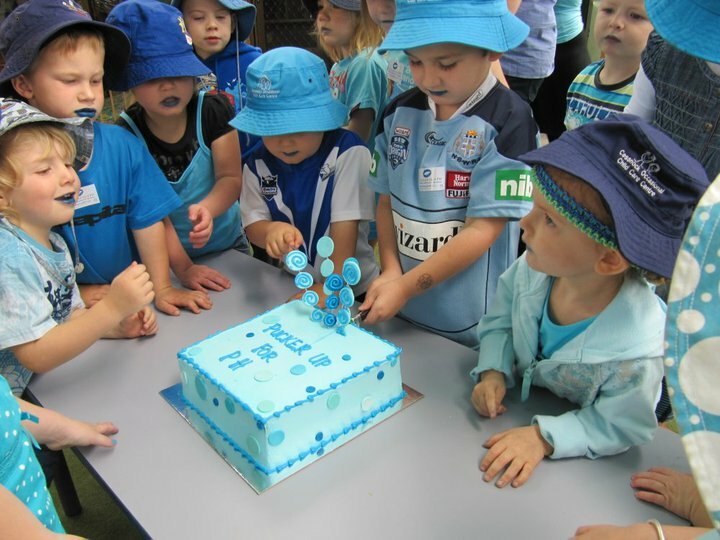 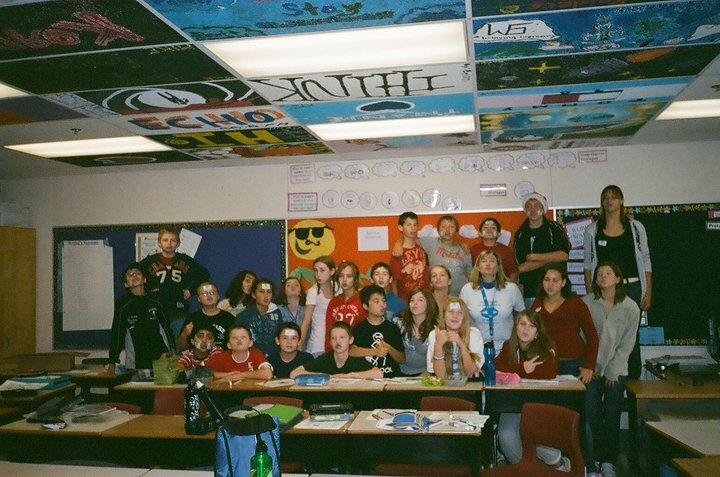 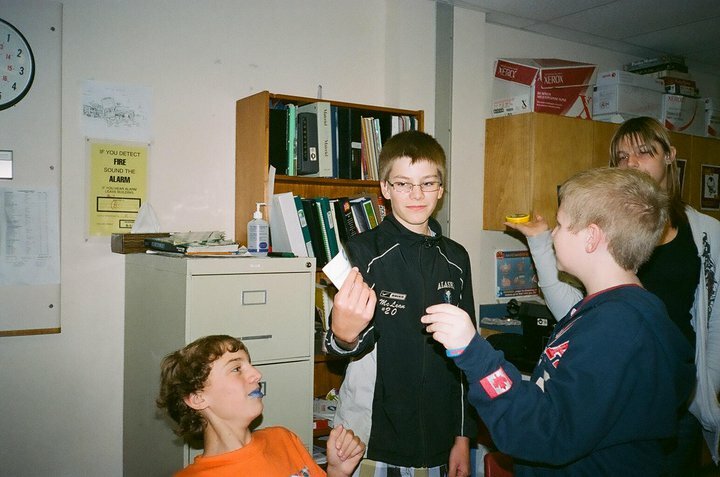 With all this activity and the parents of the kids also intrigued to find out more, it has surely not only been a terrific awareness activity, but a fun and loving rememberence of a dear little boy, Thomas McGlynn. 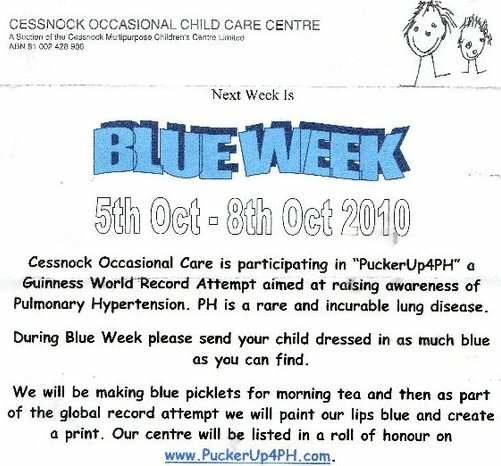 Sharing news of the developments with this campaign is something that everyone on the PuckerUp4PH team looks forward to doing. 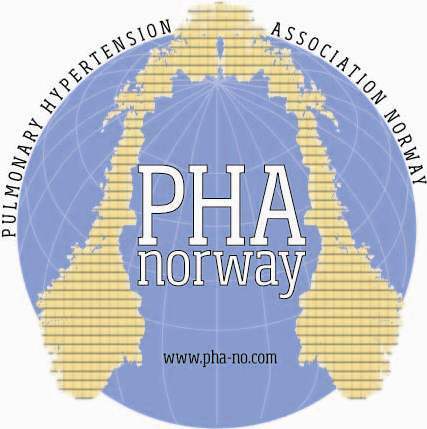 It is great to be able to share with both the wider community as well as those that live with or are affected by PAH (Pulmonary Arterial Hypertension) of all that is taking place across the World. 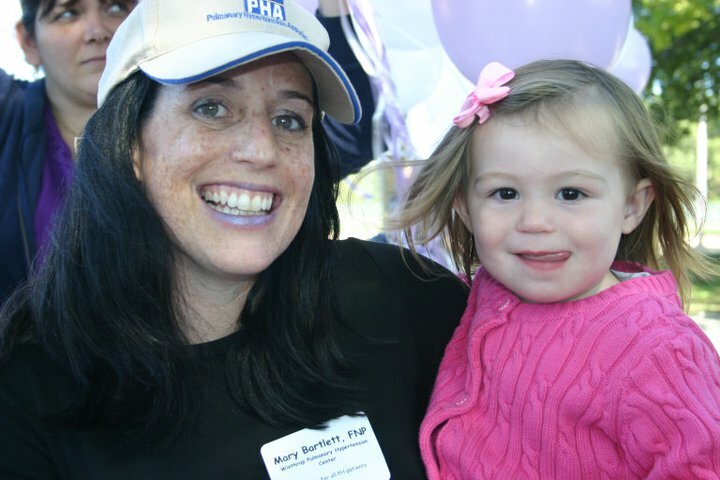 It’s great to see so many of you celebrating life, spreading the word about PAH, gaining kisses and moving us, lip print by lip print, towards a New World record. 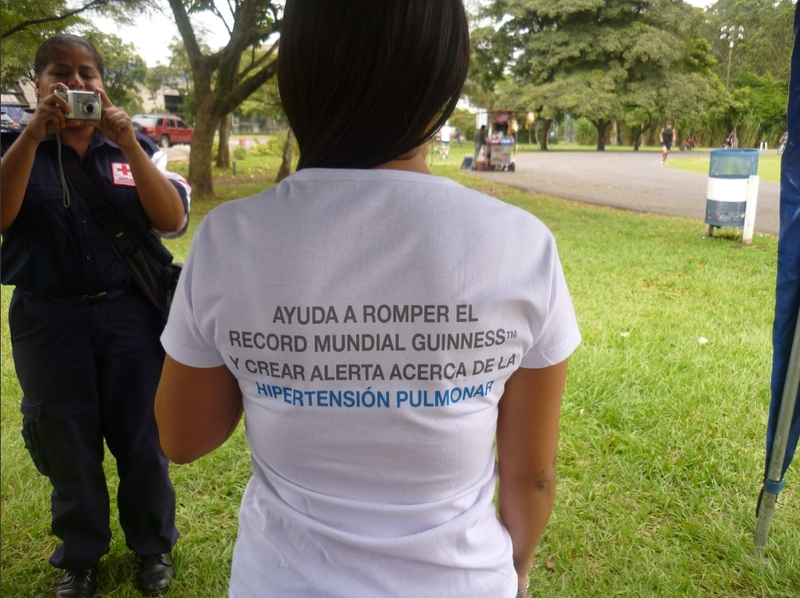 If you are reading this update from any country that isn’t currently participating in our awareness raising & world record attempt ..and would like to join PHriends in Norway, Poland and South Africa who are now joining our initiative..please, please, please do get in touch. 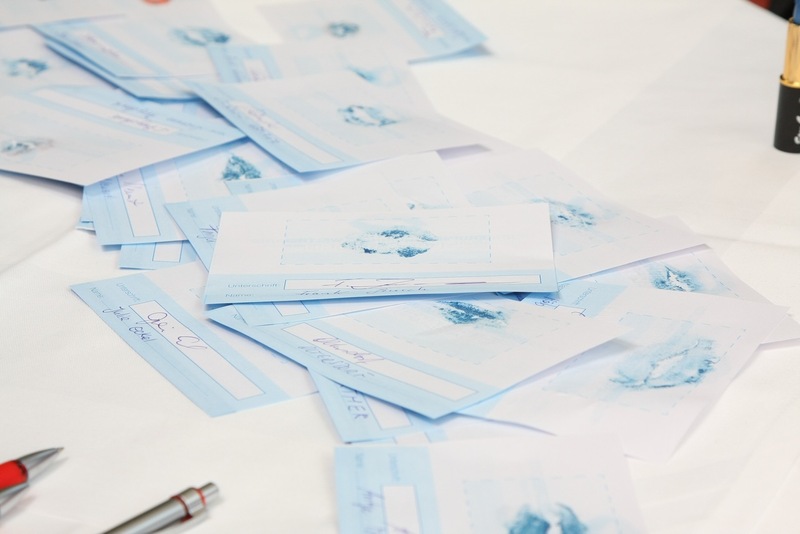 We can supply your national/regional group with High resolution PDF files, in your language (if you’d help with translations) for local printing…so please get in touch!!! 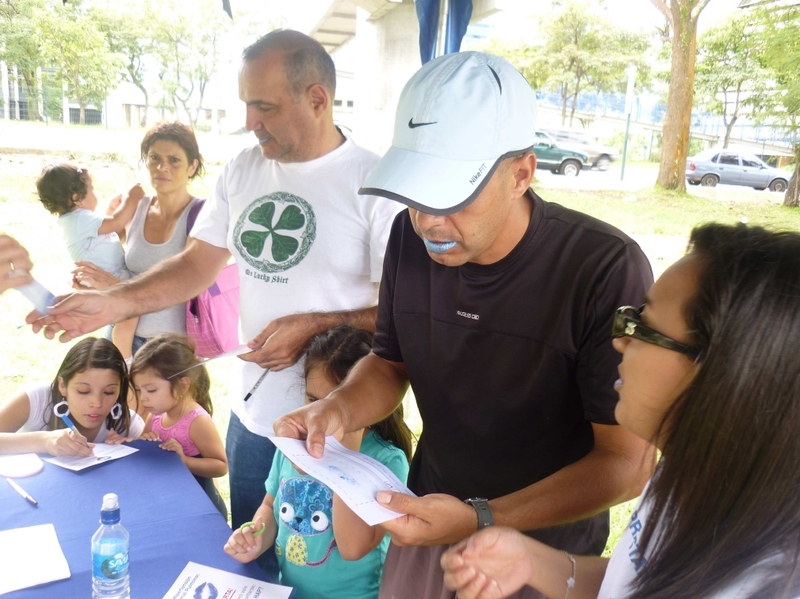 This weekend we hope to pass the half way mark to our target thanks to efforts across 4 continents..We need many many more of you to help them in the days and weeks ahead. 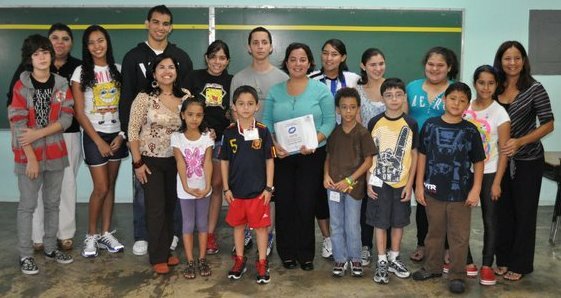 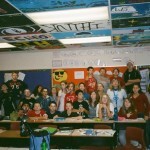 Together we can make a difference!! 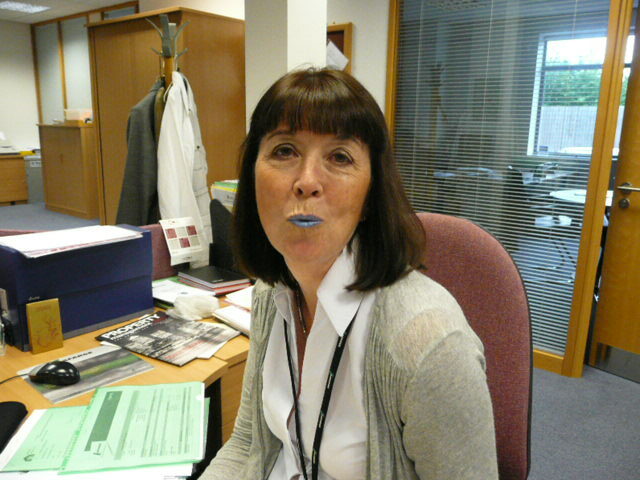 It’s great to learn of people liaising with local supermarkets/malls/libraries to set up a stall and collect Blue kisses. 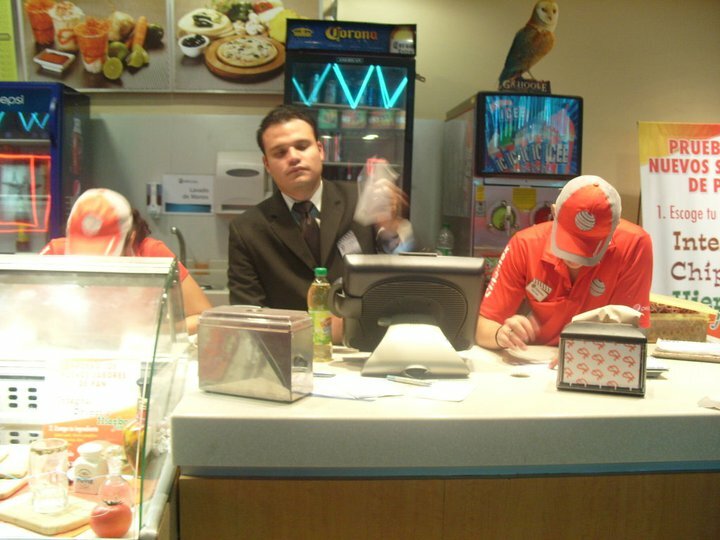 I also hear a couple of the larger cinema complexes have been helpful…as are the many church congregations/faith groups who are lending their lips to suport us.